This is another classic dinner in our house for two reasons: 1. It is fast, easy, and filling. 2. 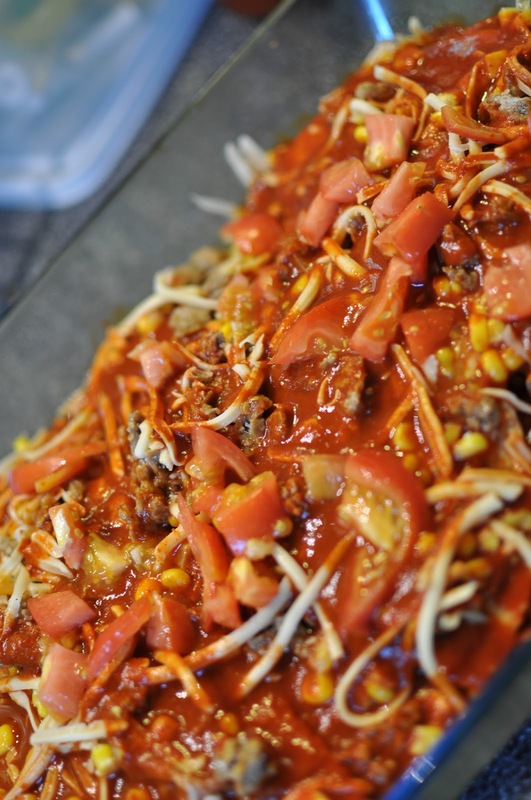 This recipe can be easily adapted and changed depending on the items you have on hand. 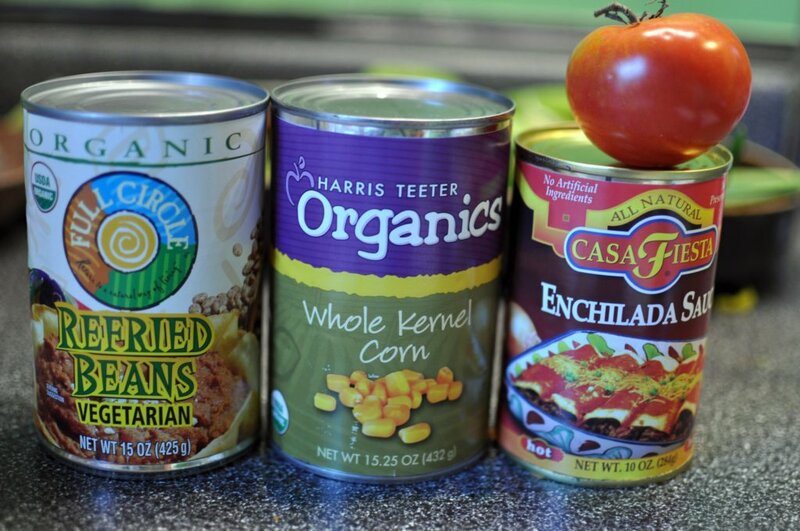 You will need 1 can refried beans, 1 can corn (or substitute frozen corn, fresh or frozen sliced bell peppers, mushrooms, etc. 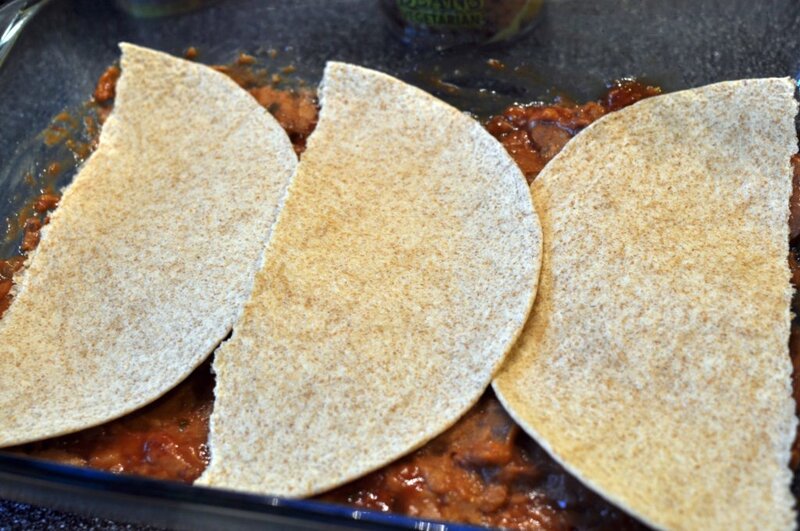 ), 1 can enchilada sauce, 8 oz of salsa, 4-1/2 – 6 soft shell taco tortillas, 1-2 cups of shredded cheese, 1 bag soy crumbles (or substitute meat of your choice) and 1 -2 fresh tomatoes. 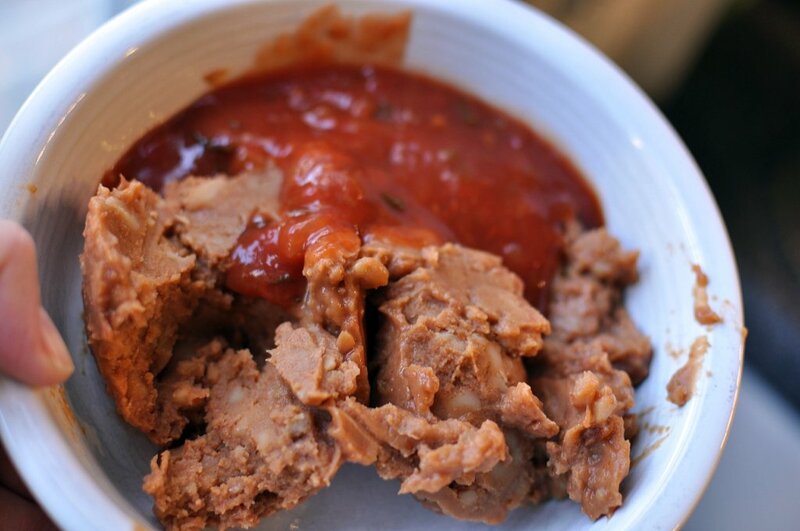 Mix the can of refried beans and salsa in a bowl. Microwave until warm and soft. 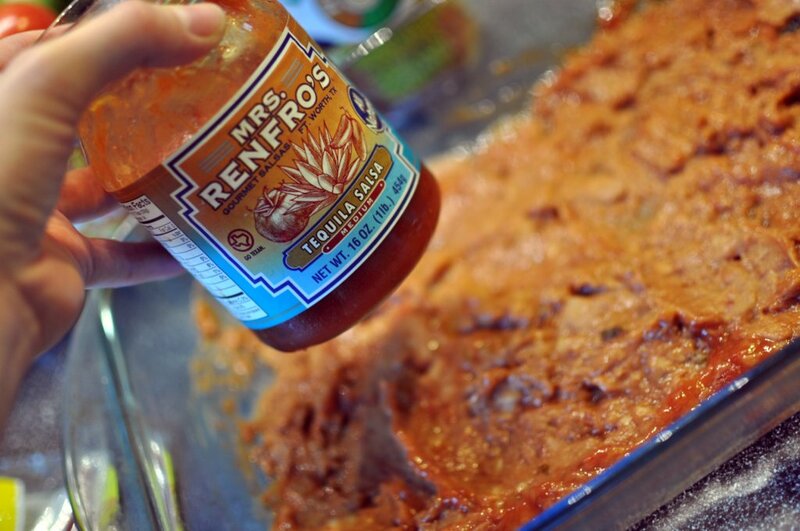 I used Mrs. Renfro’s Tequila Salsa- usually pricey but on sale recently. 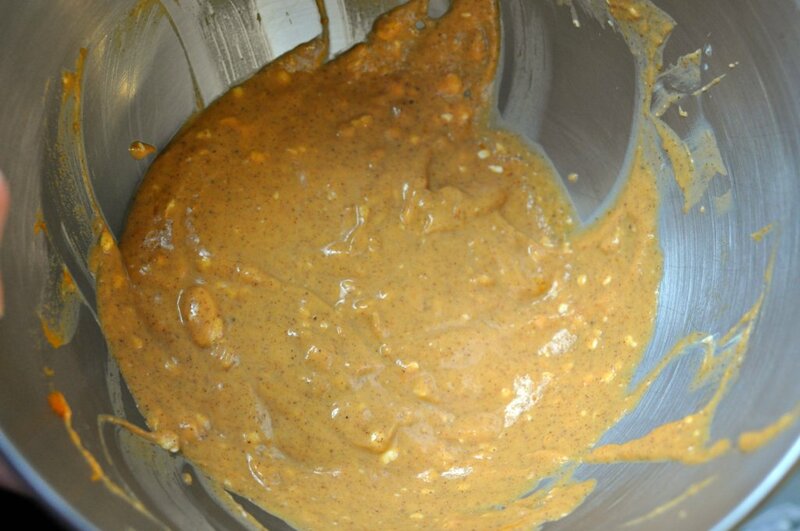 Spread 1/3 of the bean and salsa mixture on the bottom of a 9 x 13 inch baking dish. Top with 3 halves of soft taco tortillas. 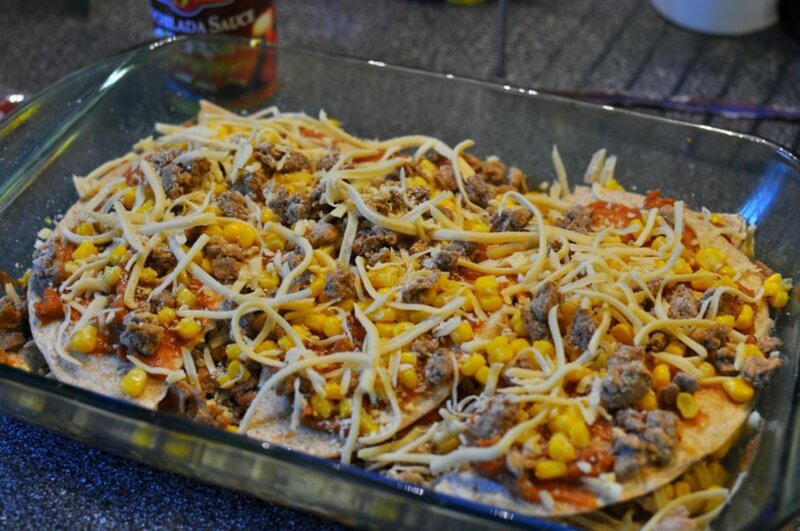 Sprinkle with 1/3 of the can of corn, soy crumbles (or another meat of your choice) , and a sprinkling of cheese. Repeat first layer 2 to 3 more times, depending on amount of ingredients and level of hunger. 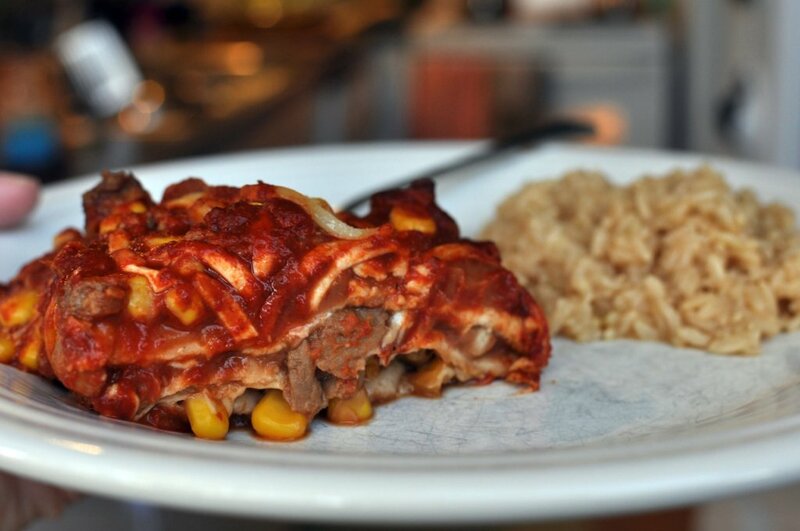 Pour 1 can of enchilada sauce over the top of the top layer. Top with fresh chopped tomatoes. Bake in a 350 degree oven for 30 minutes or until hot and bubbly. Serve with a side of cooked rice. This meal is one of my favorites and the leftovers are always so satisfying. 1. Mix 1 can of refried beans and 8 oz. salsa in a medium microwave-safe bowl. Microwave until warm and soft – about 1-2 minutes. 2. Spread 1/3 of the bean and salsa mixture on the bottom of a 9 x 13 inch baking dish. Top with 3 halves of soft taco tortillas. 3. 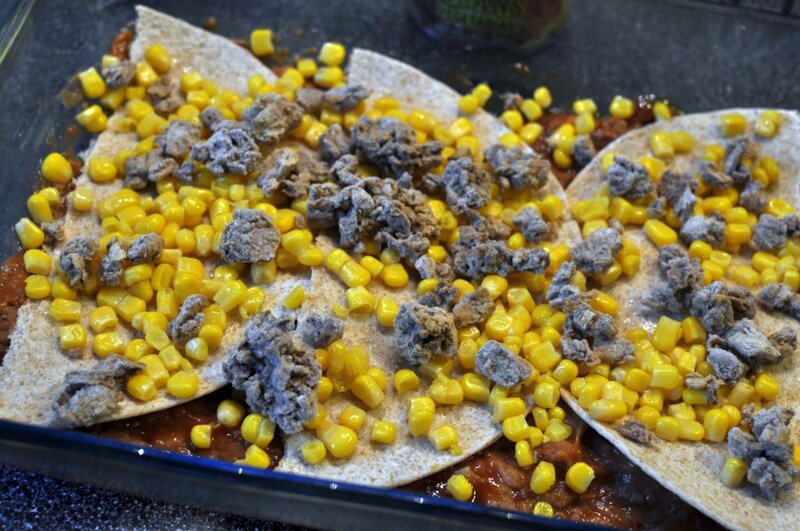 Sprinkle with 1/3 of the can of corn, soy crumbles, and a sprinkling of cheese. Repeat 2-3 more times. 4. 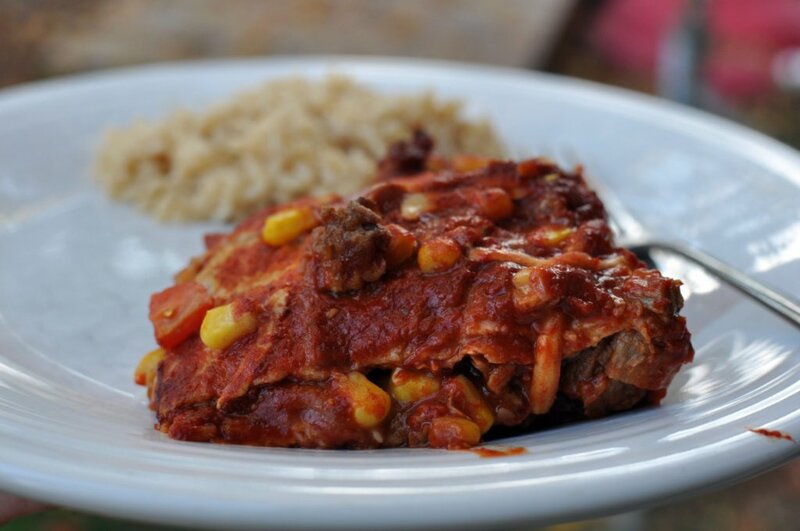 Pour 1 can of enchilada sauce over the top of the top layer. Top with fresh chopped tomatoes. Bake in a 350 degree oven for 30 minutes or until hot and bubbly. Serve with a side of cooked rice. 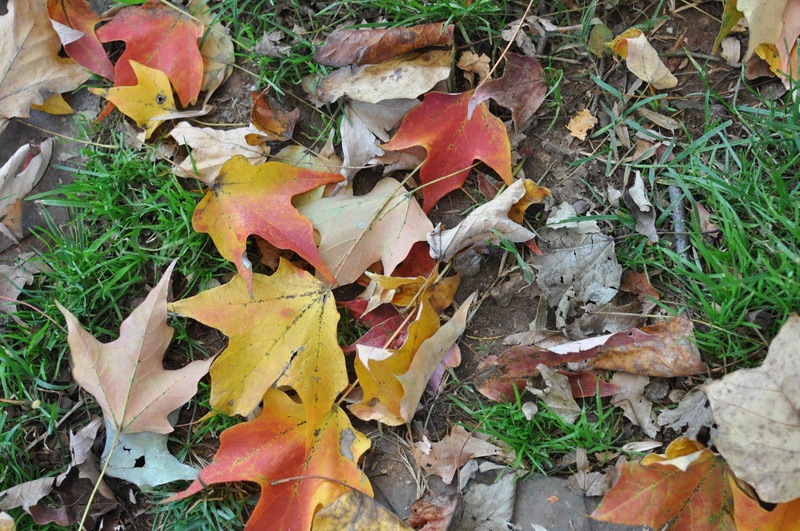 These beautiful autumn days make me want to bake and cook the comfort foods. 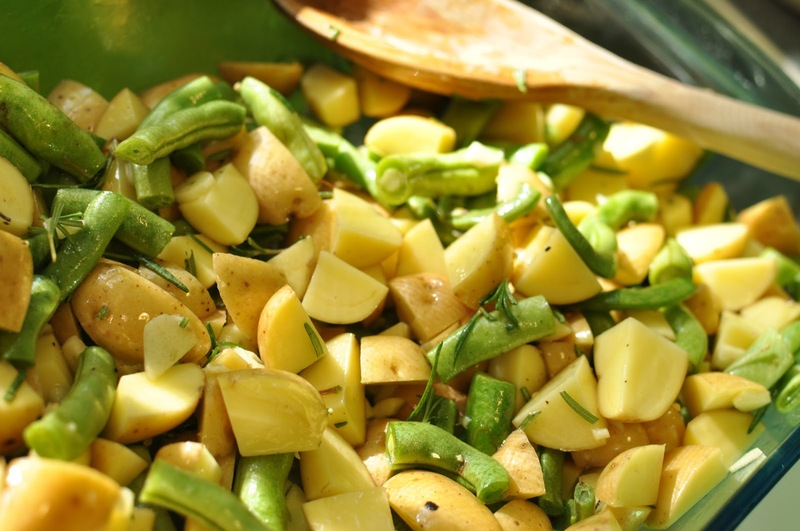 One combination our household can never get enough of is garlic + rosemary + potatoes. 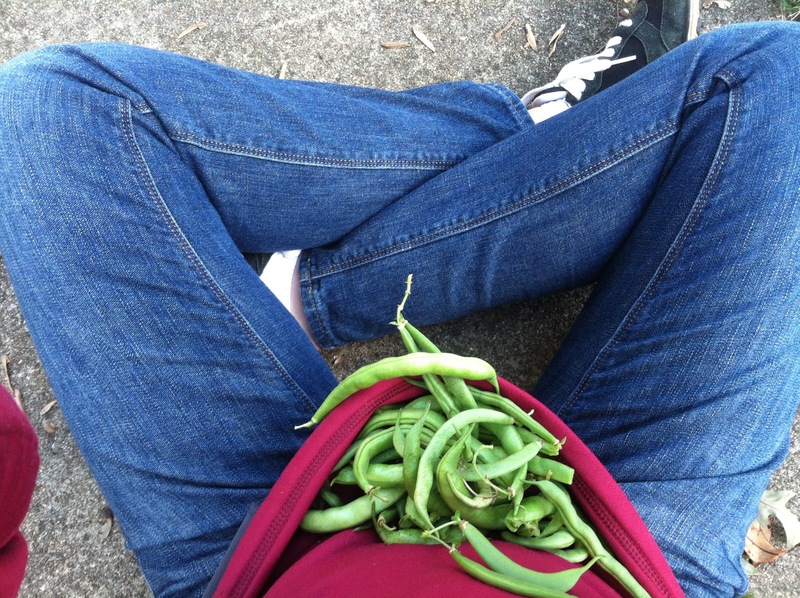 With the long growing season in North Carolina I am still harvesting green beans (okra, tomatoes, and peppers, too), so this dish was half home grown, half store bought. 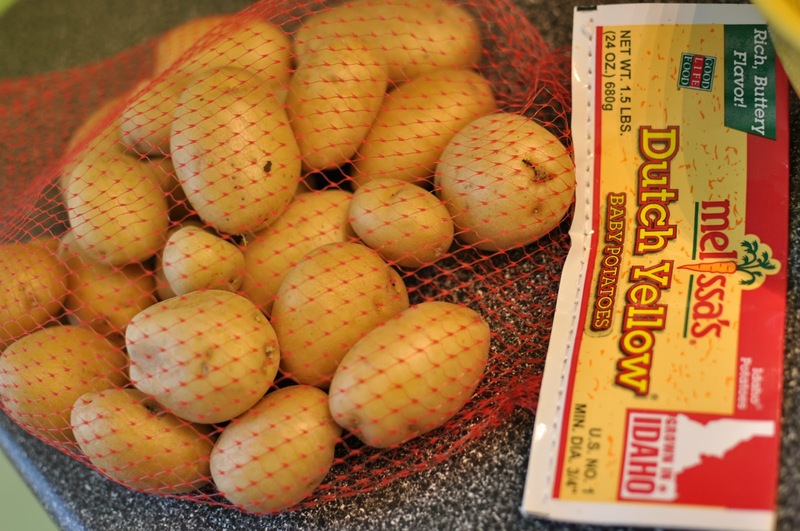 Wash and dice into 1-inch cubes, 1 bag of these Dutch Yellow Potatoes. 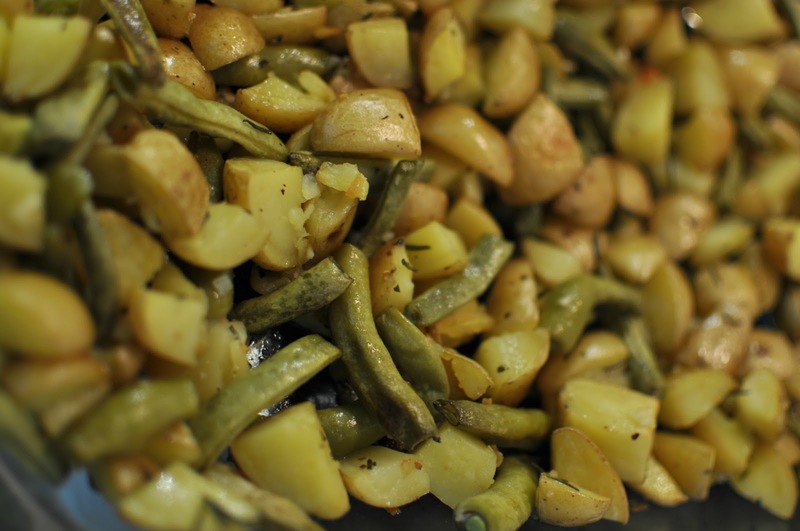 Combine in a 9 x 13 inch baking dish with chopped fresh green beans, 3 minced cloves of garlic + a sprinkling of dried garlic, fresh found pepper, sprigs of fresh rosemary, and 2 to 3 tablespoons of olive oil. Mix well, if the vegetables seem dry, add more oil. Bake in a 400 degree oven for 30 to 35 minutes, stirring once halfway through. 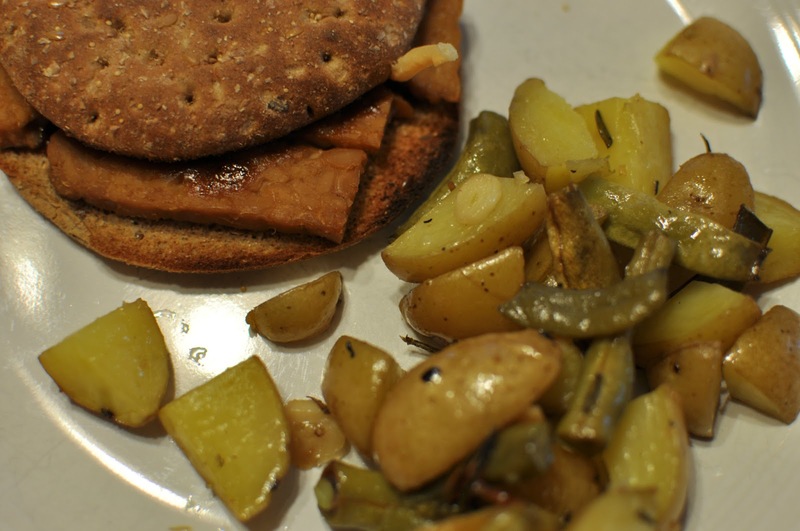 I made up a couple of quick Sesame Garlic Tempeh melts to go with our garlicky beans & potatoes. Just take a sandwich thin, add sliced tempeh, cheese if you like, and an Asian stir fry sauce of your choice and broil on low for 5 minutes. 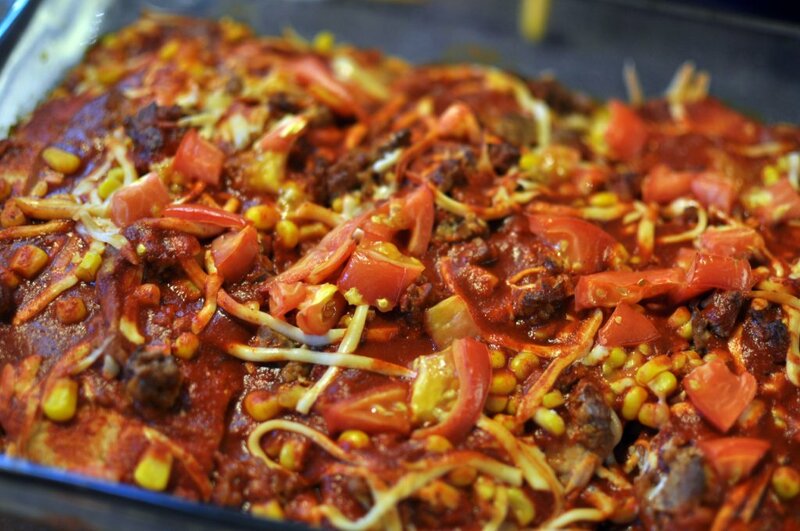 There you have it – an easy weeknight meal – enjoy! 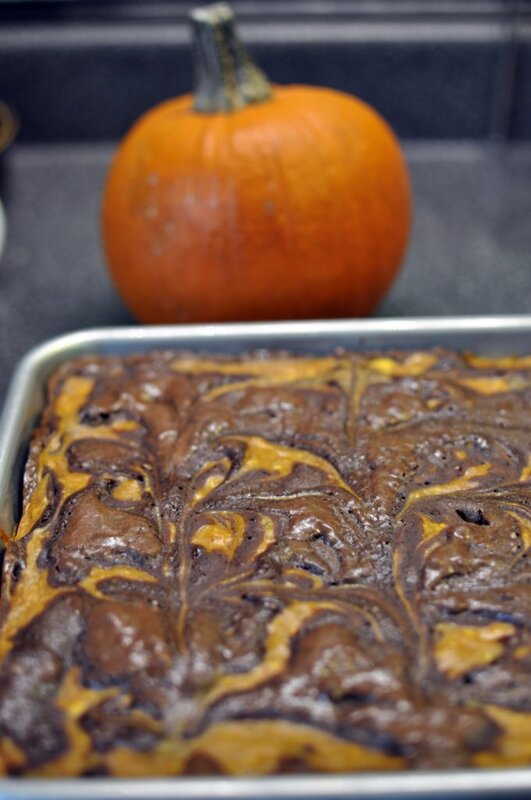 These Pumpkin Cream Cheese Brownies, courtesy of Betty Crocker, are the perfect Halloween dessert. I made them this weekend to take along to a Halloween party, but more on that in a minute. 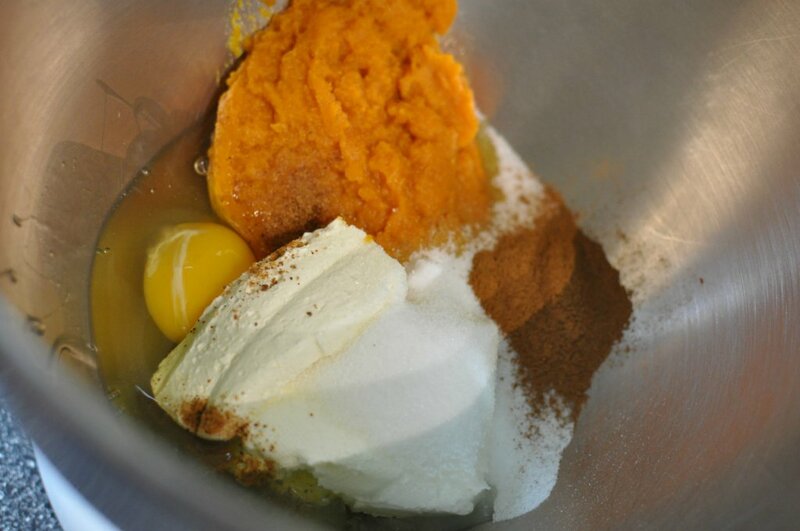 In a bowl, or mixing stand, combine 3 oz of cream cheese, softened, 1/2 cup canned pumpkin puree, 1 egg, 3 tablespoons sugar, 1 teaspoon cinnamon, and 1/4 teaspoon nutmeg. Beat on low speed until smooth. Set aside. 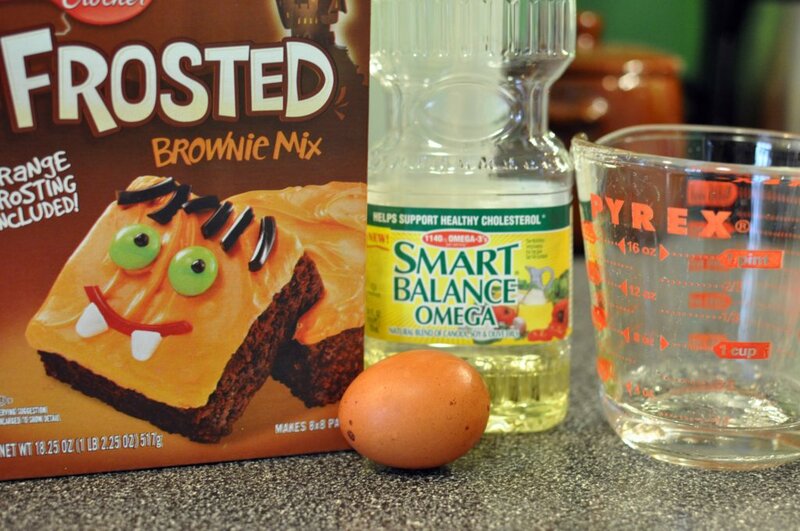 Mix up brownies as on box. Spread 3/4 of brownie batter into greased pan (Betty Crocker recommends a 9-inch pan). 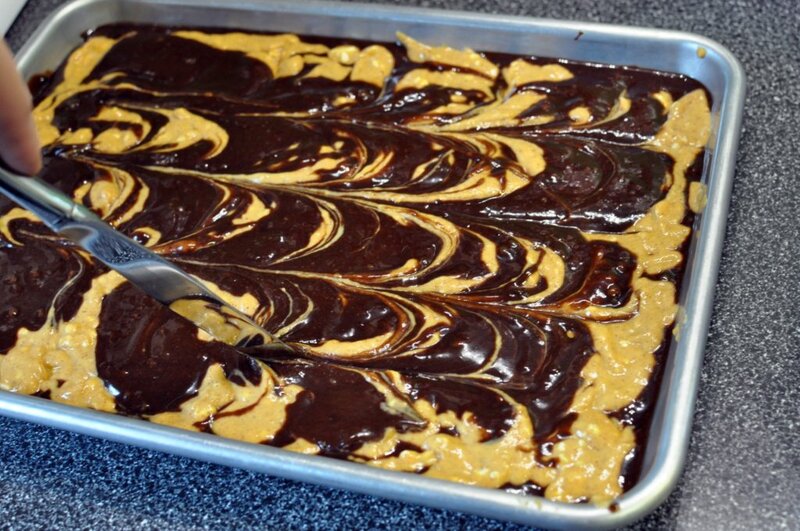 Using a spoon, spread the pumpkin filling evenly over the brownie batter. Spoon remaining brownie batter over top of the the pumpkin filling. 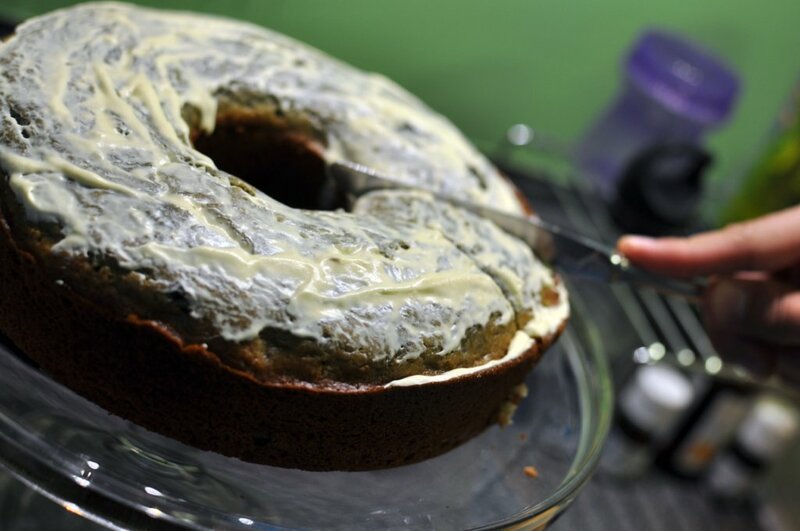 Cut through the batter with a knife, vertically and then horizontally to create a marbled design. Bake at 350 degrees for 40 to 45 minutes or until a knife inserted 1 inch from the side comes out almost clean. Cut into rows, store in the refrigerator, covered. Or take them to your Halloween party and let them be gobbled up. I certainly was not about to leave these bad boy sitting around my house – I wanted others to eat them. 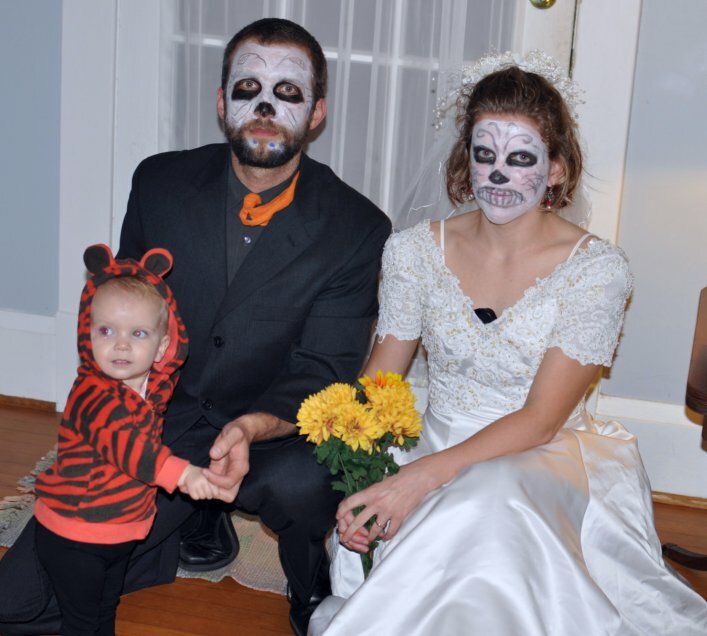 Eric and I went as Dia de los Muertos bride and groom this year. Greta was a cat, complete with a tail. I sewed a piece of black felt together with a wire inside of it, to help it curl and then pinned it to her tiger sweatshirt that came with the adorable ears. No make-up for her though – she’s battling another cold. 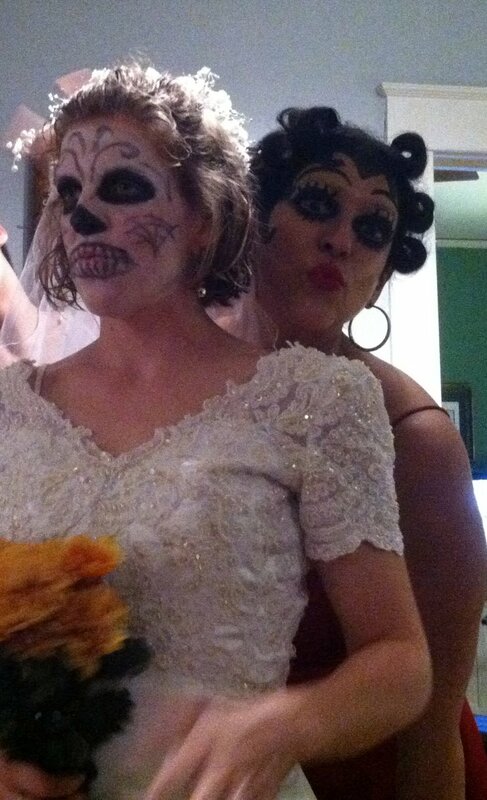 We went to a friend’s house – she was Betty Boop – don’t you just love her make-up?! 1. 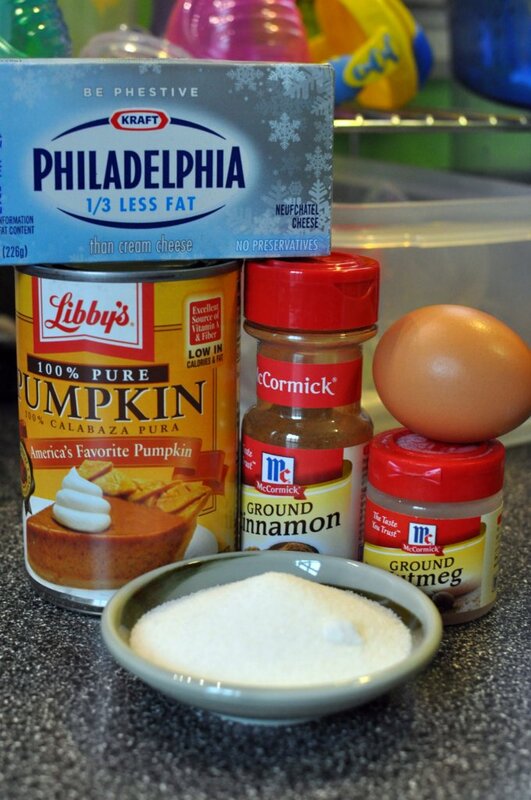 In a bowl, or mixing stand, combine 3 oz of cream cheese, softened, 1/2 cup canned pumpkin puree, 1 egg, 3 tablespoons sugar, 1 teaspoon cinnamon, and 1/4 teaspoon nutmeg. Beat on low speed until smooth. Set aside. 2. 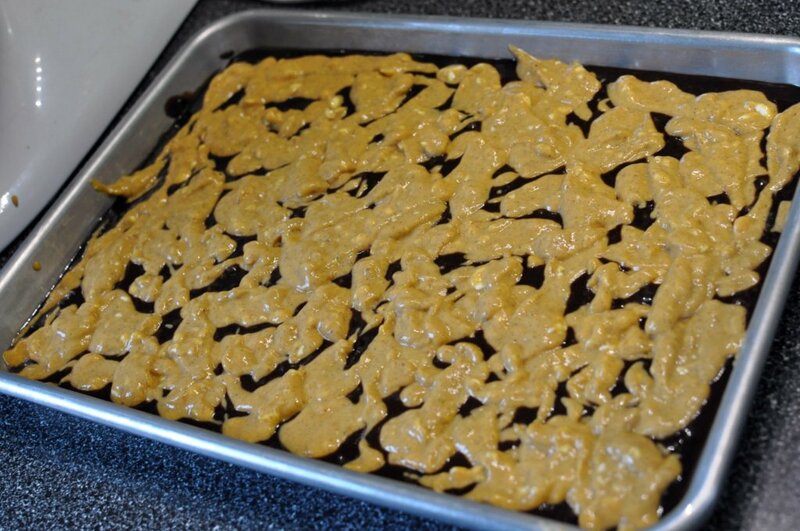 Mix up brownies as on box mix. 3. Spread 3/4 of brownie batter into greased pan (Betty Crocker recommends a 9-inch pan). 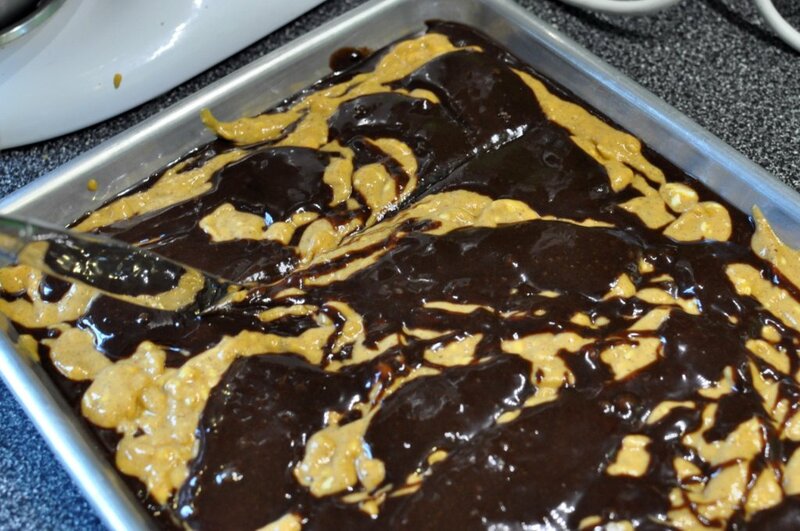 Using a spoon, spread the pumpkin filling evenly over the brownie batter. Spoon remaining brownie batter over top of the the pumpkin filling. 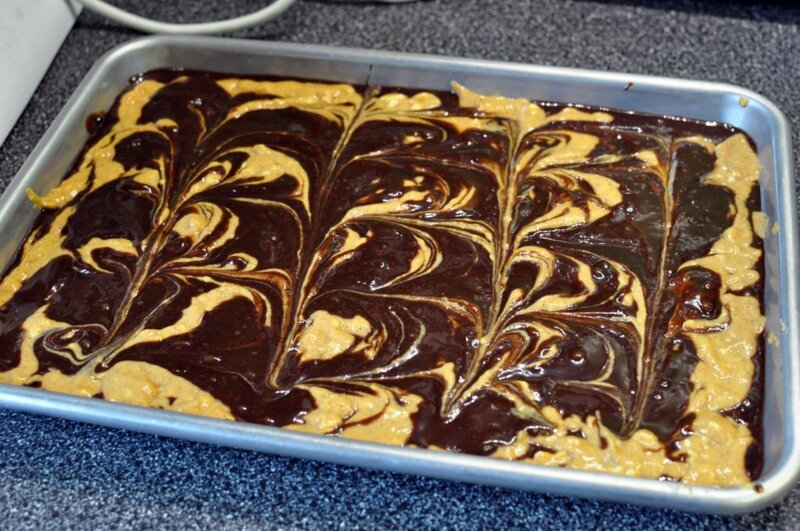 Cut through the batter with a knife, vertically and then horizontally to create a marbled design. 4. Bake at 350 degrees for 40 to 45 minutes or until a knife inserted 1 inch from the side comes out almost clean. Cut into rows, store in the refrigerator, covered. I have to admit, I’ve always wanted to try this pan. Has anyone else tried it? 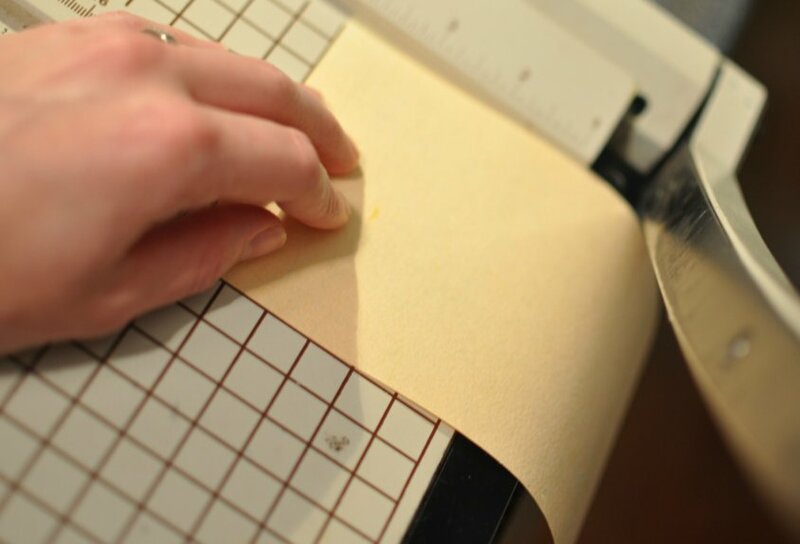 I love sewing with paper – it’s my new favorite go-to decor project. Here’s my 30 minutes or less Halloween paper garland. I started with some orange paper – left over from when I thought I was going to make my own wedding invitations – ha! 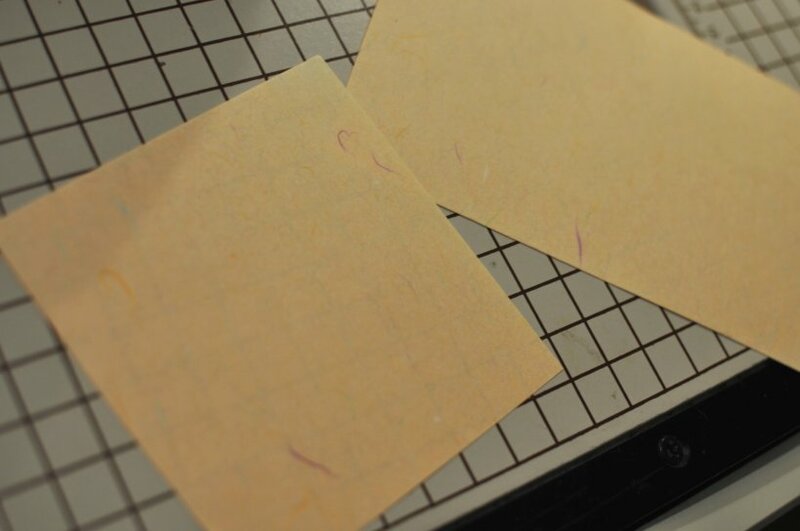 This paper has beautiful strands of colorful fibers in the paper. I cut 10 squares into 4 x 4 inch pieces. 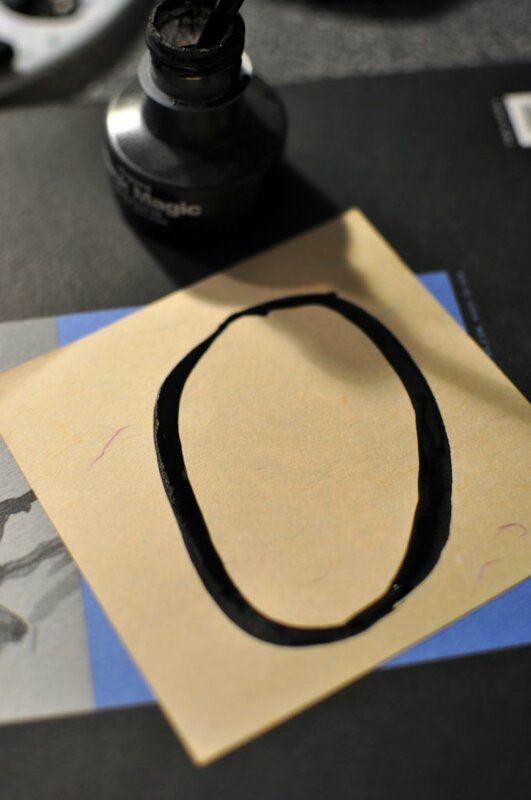 Using India ink, I painted designs on the pieces of paper. I sewed them together, corner to corner. Be sure to leave plenty of extra thread at each end to affix your garland to whatever item you choose. 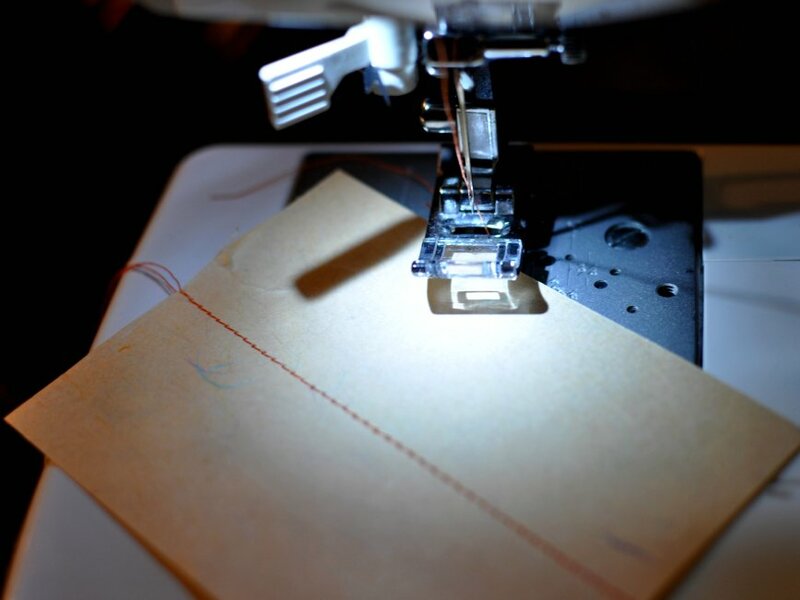 I always recommend sewing a test strip of paper, before launching into your project. This is a cheap and easy way to decorate for any occasion. If you do not fancy yourself a painter or drawer, this would be just as easy to do with clip art. In other news, a big fresh bottle of vanilla showed up, courtesy of my in-laws! Hooray, it is safe to bake again. 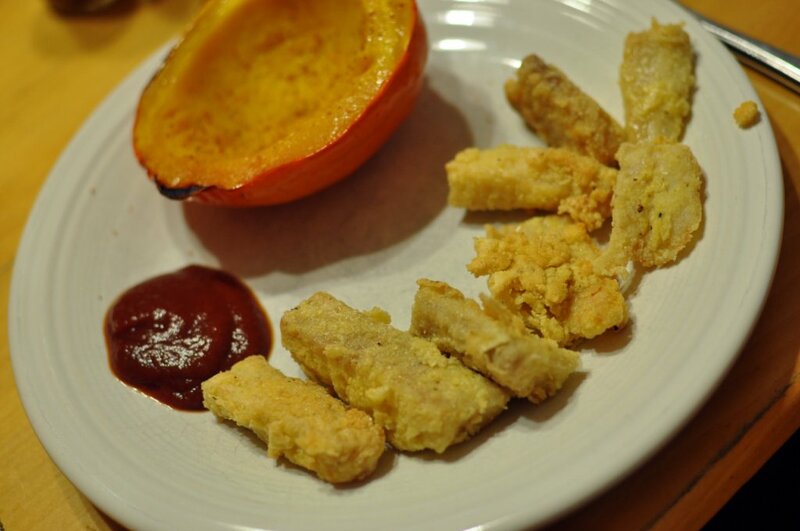 Behold the new favorite fried meal in our house – Cornmeal Fish Sticks with Chipotle ketchup and baked acorn squash. 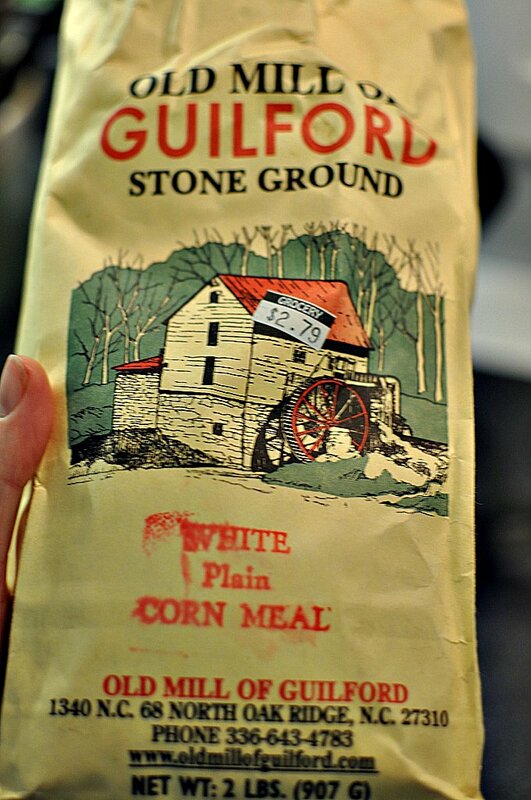 We have a local mill in town and they make the best stone ground corn meal. 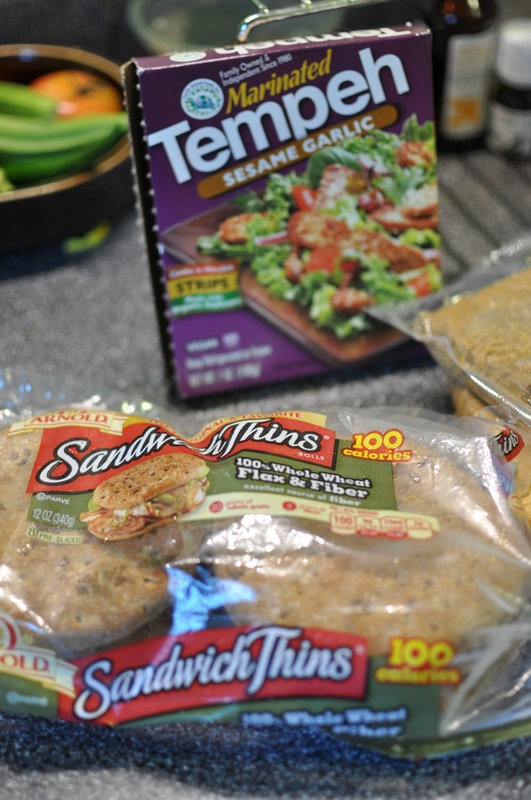 I pulled this good stuff out the other night for an easy fish stick recipe that is sure to please. 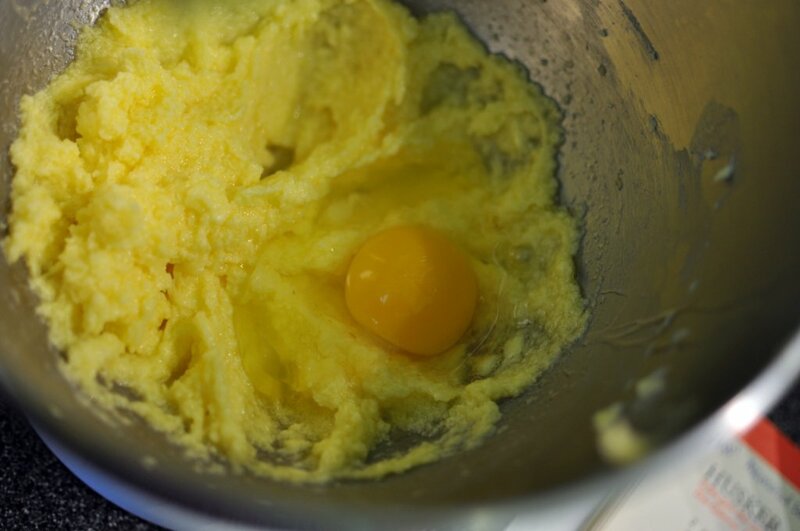 In one bowl, whisk 2 eggs. 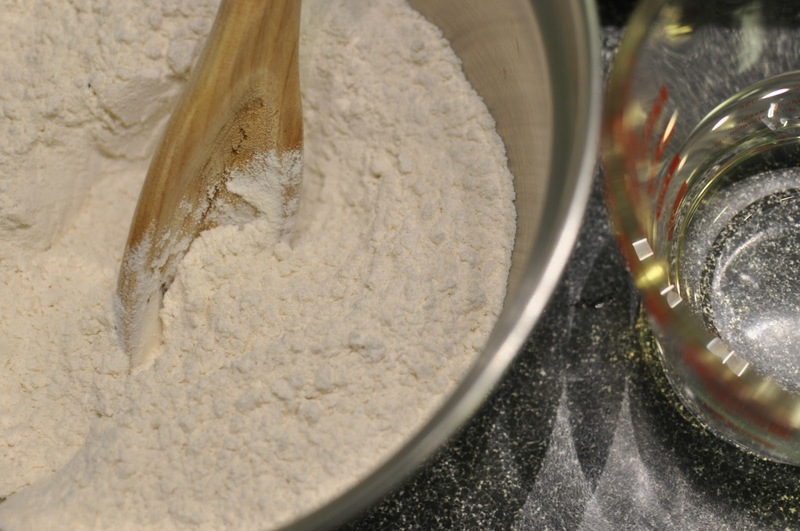 In another bowl, stir 1/2 cup flour, 1/2 cup cornmeal, and fresh ground pepper. Slice 12 oz of tilapia – about 4 fillets. 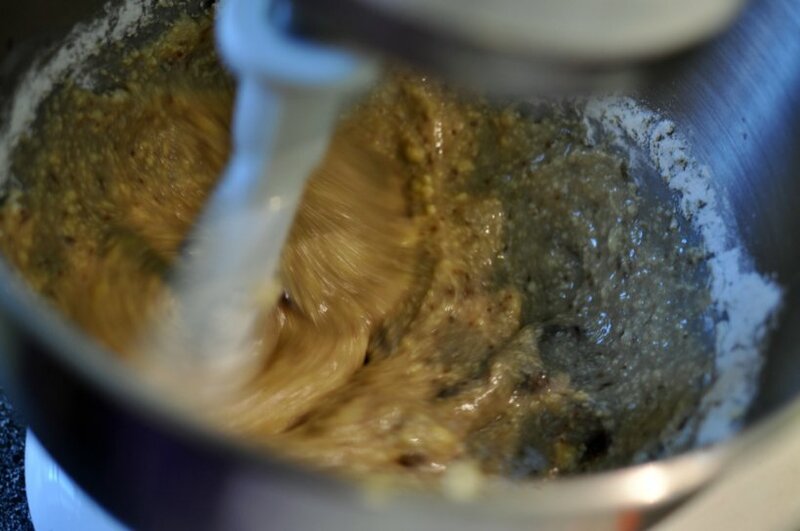 transfer to the cornmeal mixture. Pat to ensure cornmeal mixture sticks to fish slices. 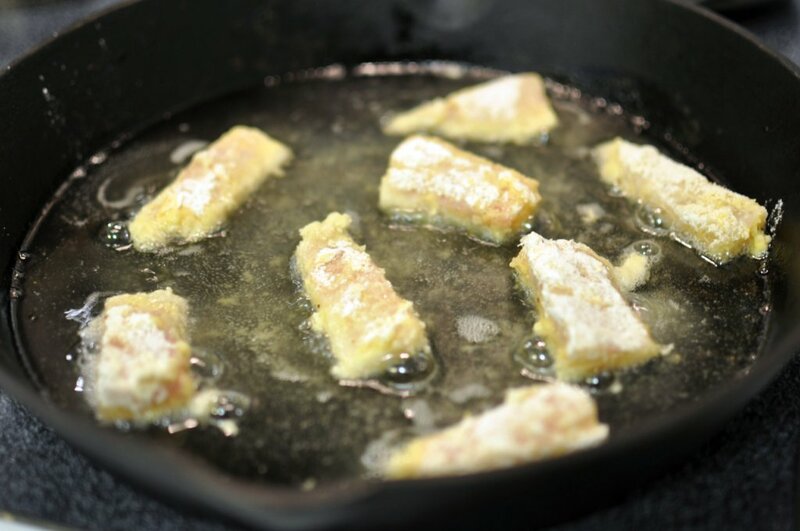 In a large skillet, heat 1 cup cooking oil over medium-high heat. 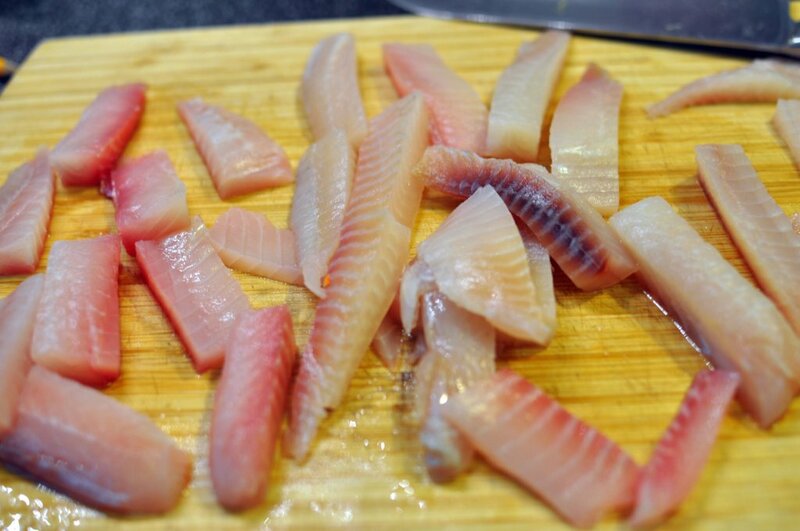 In batches, cook the fish slices until golden brown and opaque throughout. Cook fish slices 4-6 minutes, turning once. If fish starts to cook too quickly, turn heat down. Place on a foil lined baking sheet in a 250 degree oven to keep warm. I realized that after all these years I have been cooking acorn squash incorrectly. 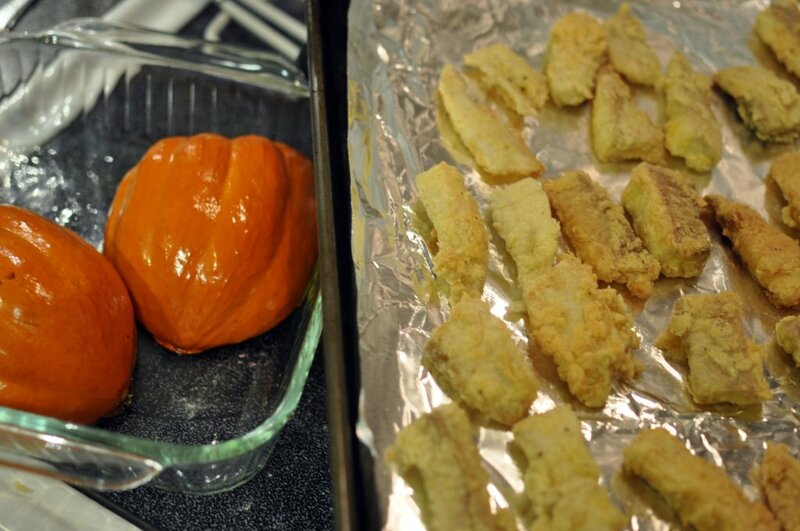 Tonight, I sprayed both sides with olive oil, and placed the acorn squash hollow side down in the baking dish. I then baked it at 425 degrees for 35 to 40 minutes or until soft. The inside was much moister and tastier. Flipping the squash over was an easy way to prevent drying out. Now, I just add the flavorings to the inside at the end of cooking. Serve fish sticks with ketchup or spicy ketchup – simply mix ketchup with a dash of chipotle sauce for an extra tasty dipping sauce. 1. 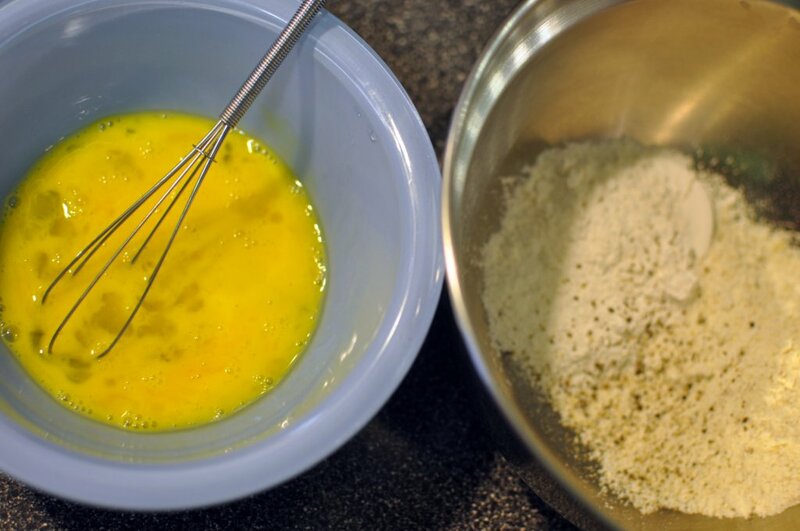 In one bowl, whisk 2 eggs. In another bowl, stir 1/2 cup flour, 1/2 cup cornmeal, and fresh ground pepper. 2. Slice 12 oz of tilapia (about 4 fillets) into 1-inch thick strips. 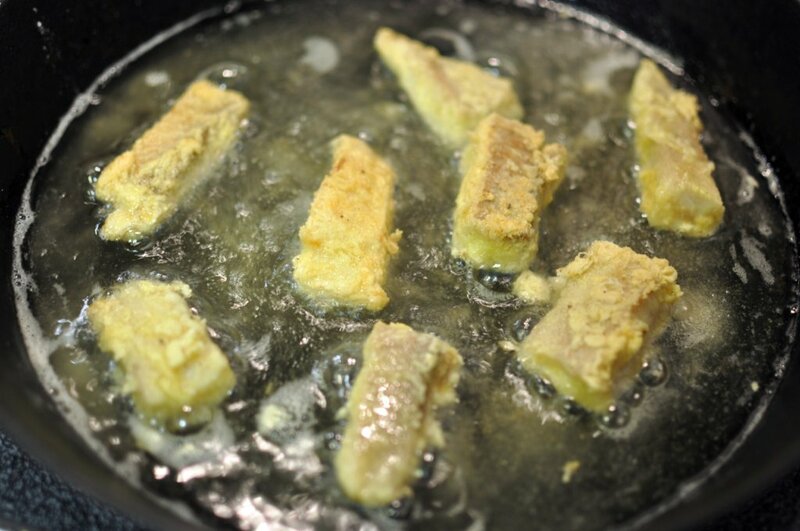 Coat fish slices in eggs, let extra egg mixture drip off and then transfer to the cornmeal mixture. 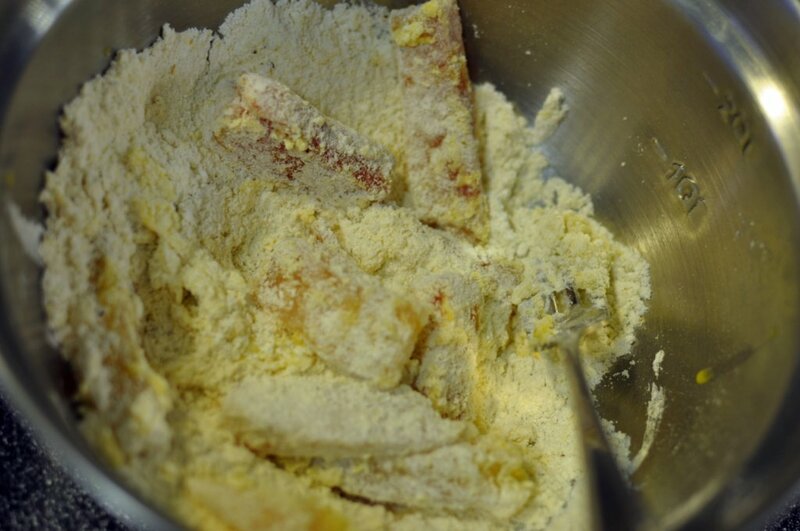 Pat to ensure cornmeal mixture sticks to fish slices. 3. In a large skillet, heat 1 cup cooking oil over medium-high heat. 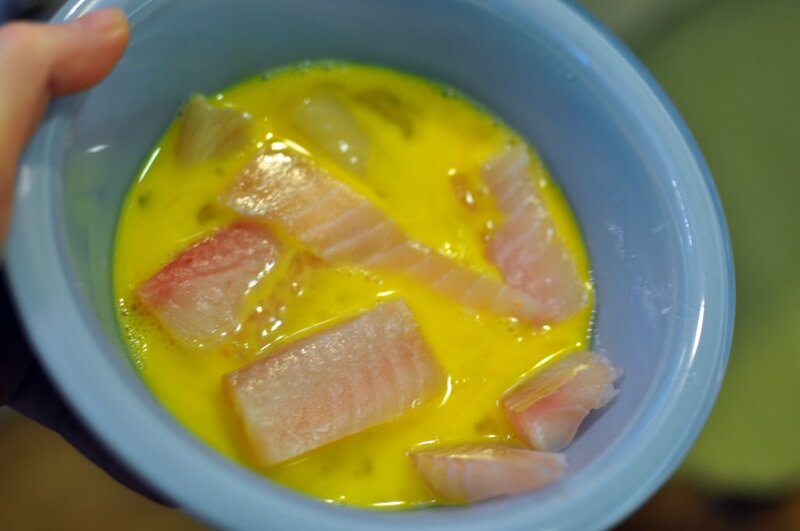 In batches, cook the fish slices until golden brown and opaque throughout. Cook fish slices 4-6 minutes, turning once. If fish starts to cook too quickly, turn heat down. 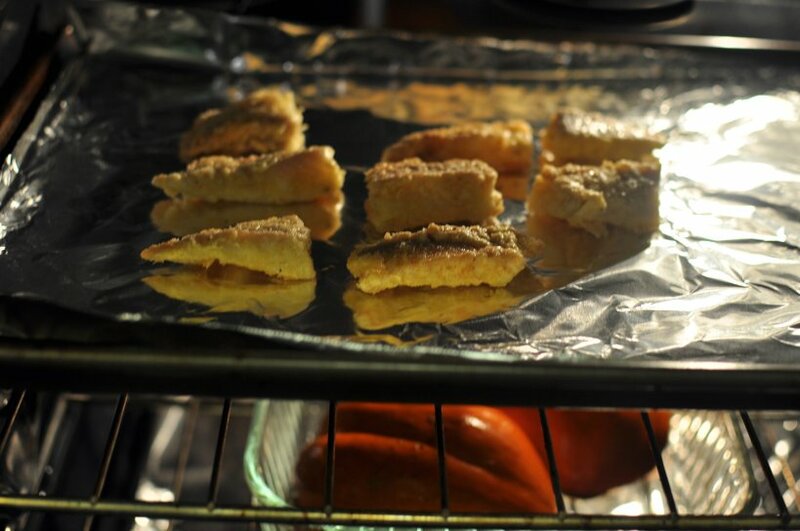 Place on a foil lined baking sheet in a 250 degree oven to keep warm while frying the rest of the fish. 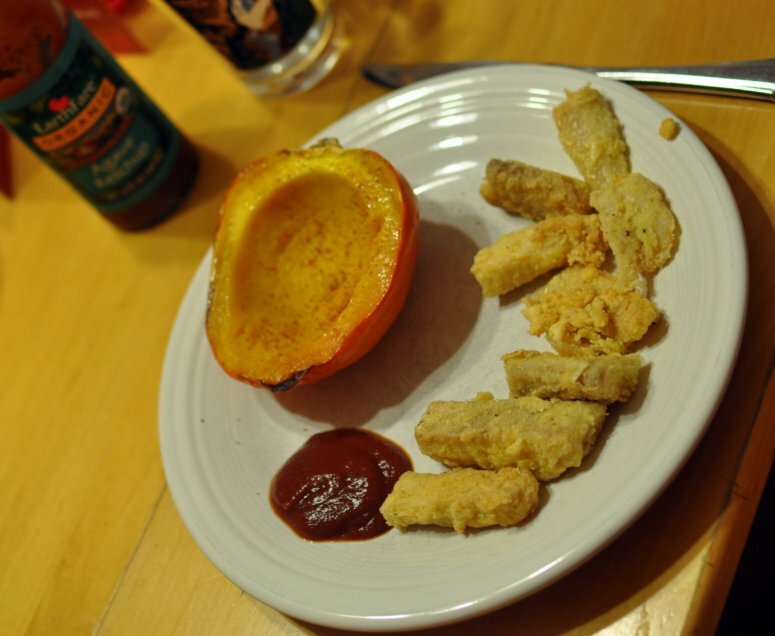 Serve fish sticks with ketchup or spicy ketchup – simply mix ketchup with a dash of chipotle sauce. 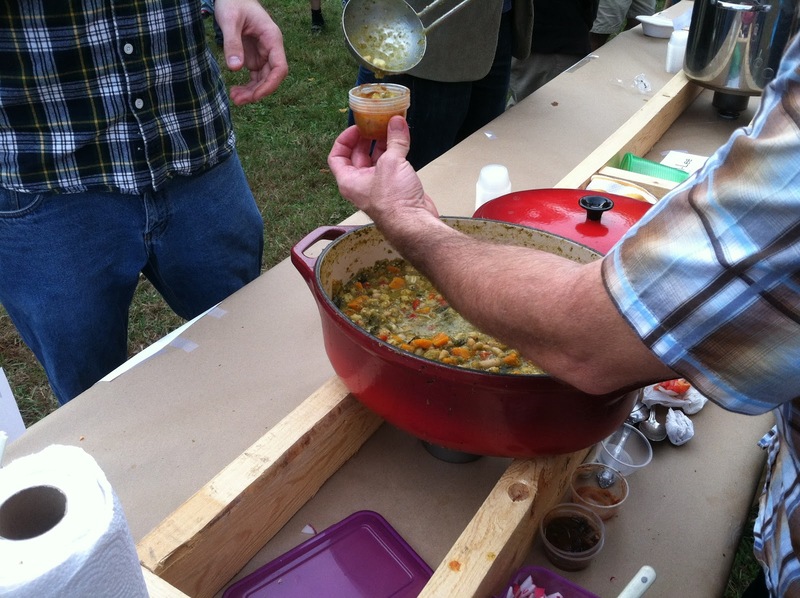 Saturday was a beautiful day for the Lindley Park Chili Cook-off. 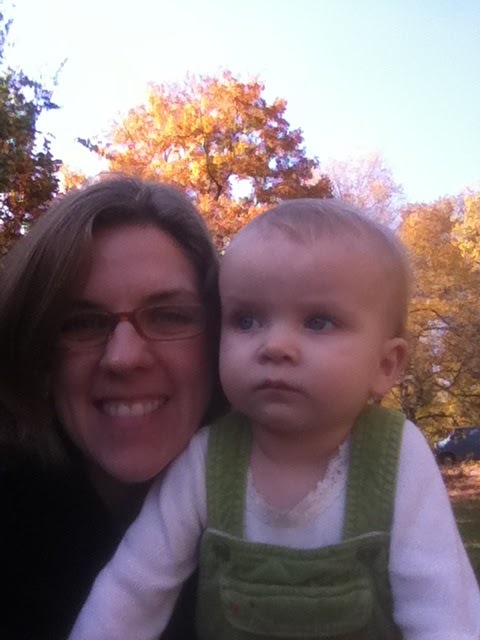 After a day of playing outside, raking leaves, and working on some projects, we headed down to the neighborhood party. 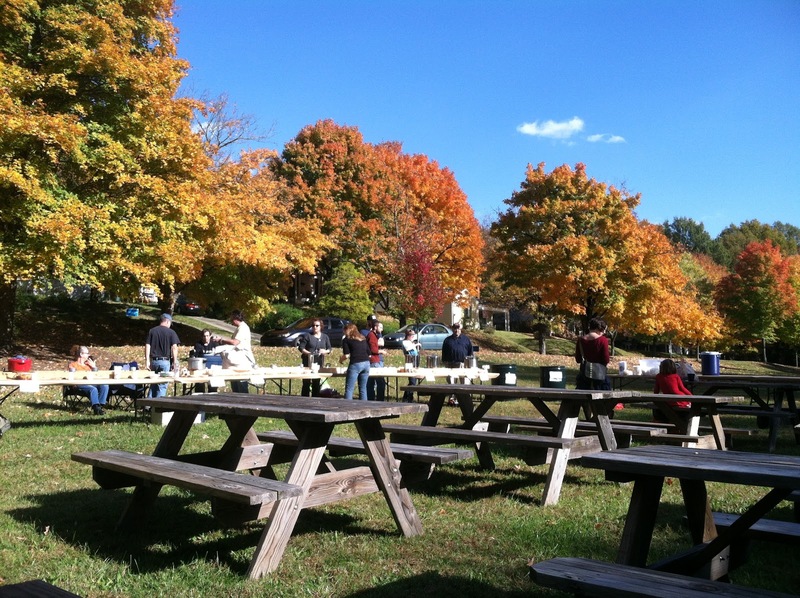 There were plenty of picnic tables set up, an area for a UNCG band to play, and plenty of room for the chili. Greta was dressed in cozy overalls – it has been getting chilly here at night (no pun intended!). 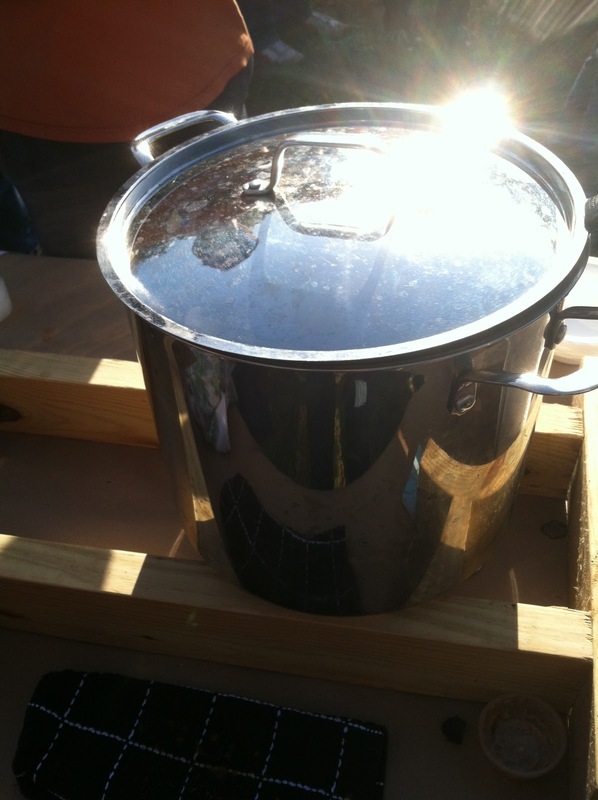 I set up my Smoky Beer Chili on the tasting line – the organizers set up fancy troughs made from 2x4s with sterno cans in between to keep our chili warm. I was surprised at how warm my chili stayed all evening. Each chili chef stood behind his or her pot of chili and served until 6 or when the chili ran out. Each chef served small tasting cups or into bowls brought from people’s homes. Two advantages to being a server in the chili line: talking to everyone and getting to see the variety in people’s bowls. 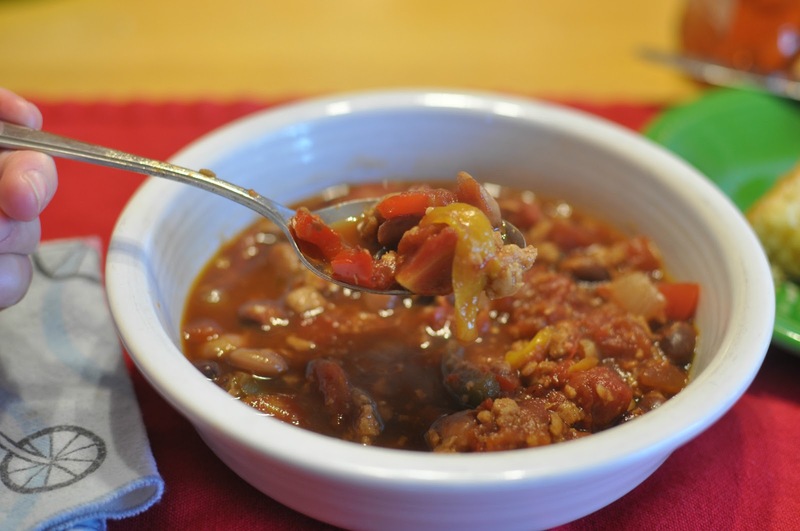 This is a photo of the chili to my left – his chili featured hominy, squash, tomatillos, and poblano peppers. It was delicious and beautifully colorful. After a long evening of answering questions, handing out samples, and meeting neighbors the votes were tallied. I ended up receiving third place in the vegetarian section! The woman to my right received first place and the man to my left received second place. 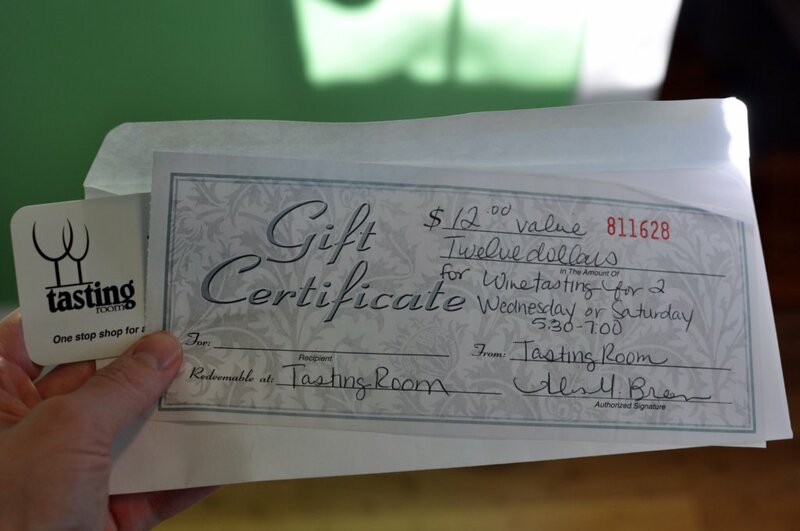 I felt honored and even happier at the gift certificate to the Tasting Room – a wine bar in our neighborhood. We took things easy today and hung around the house. This afternoon, I decided to use up some of the figs that have been lurking in my fridge this week. I opted for a fig cake for dessert tonight. I made the fig syrup at breakfast and allowed it to cool cool and set until this evening when I added it to a cake. 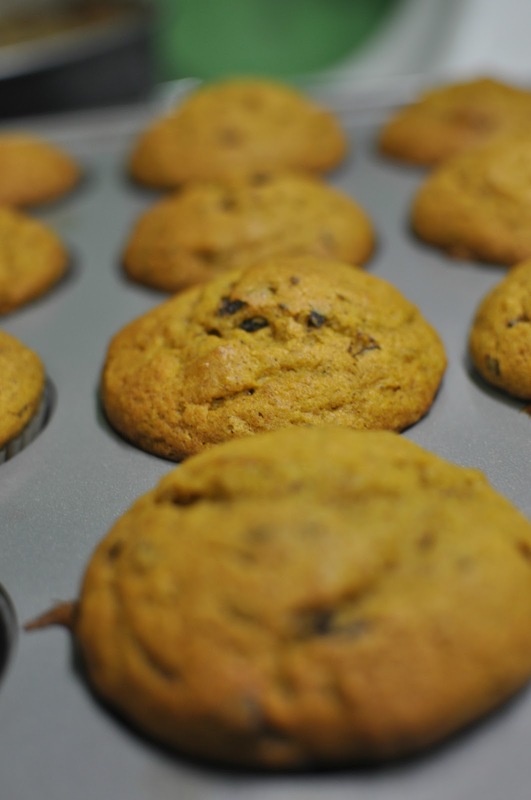 First, in a medium mixing bowl combine 2-1/3 cups all-purpose flour, 2 teaspoons baking powder, 1/2 teaspoon baking soda, and 1/2 teaspoon salt. Set aside. 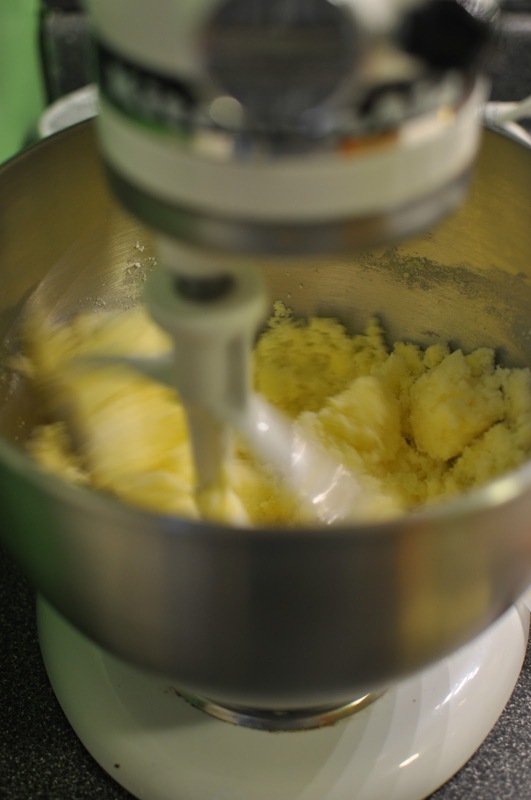 In a large mixing bowl or in a mixing stand, beat 1/2 cup margarine or butter and 3/4 cup sugar together til fluffy. Add 2 eggs, 1 at a time, beating about 1 minute after each addition. Next add in the 1-1/2 cup fig syrup. See below for recipe. 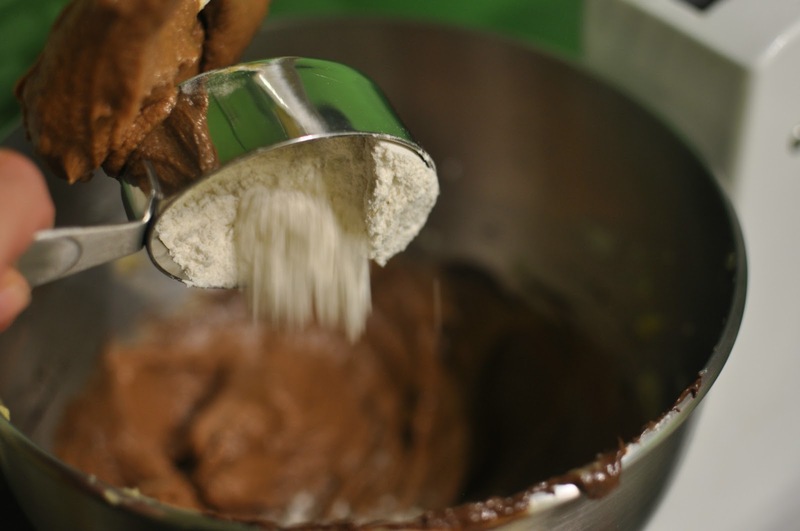 Add 1/2 cup milk and dry ingredients alternately to egg mixture, beating just til combined after each addition. Pour batter into greased (I have learned to only use margarine) flute pan. Bake in a 350 degree oven for 40 to 45 minutes or til a toothpick comes out clean. Cool in pan about 10 minutes. 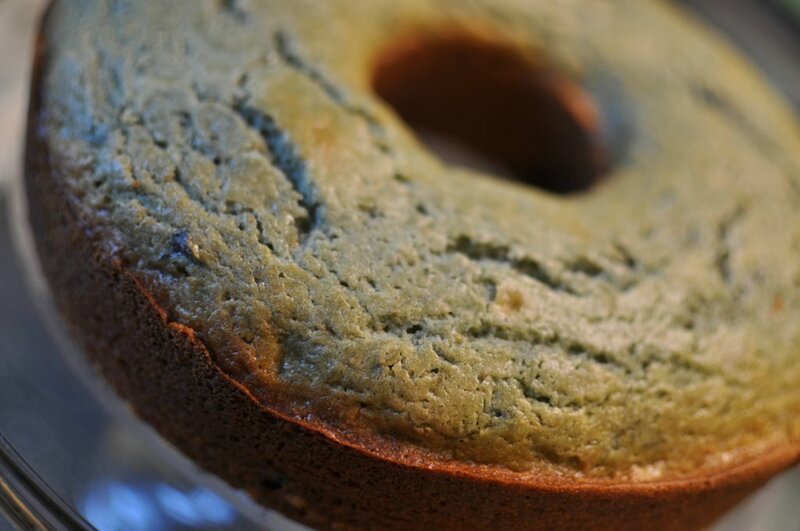 Remove cake from pan, allow to cool completely. 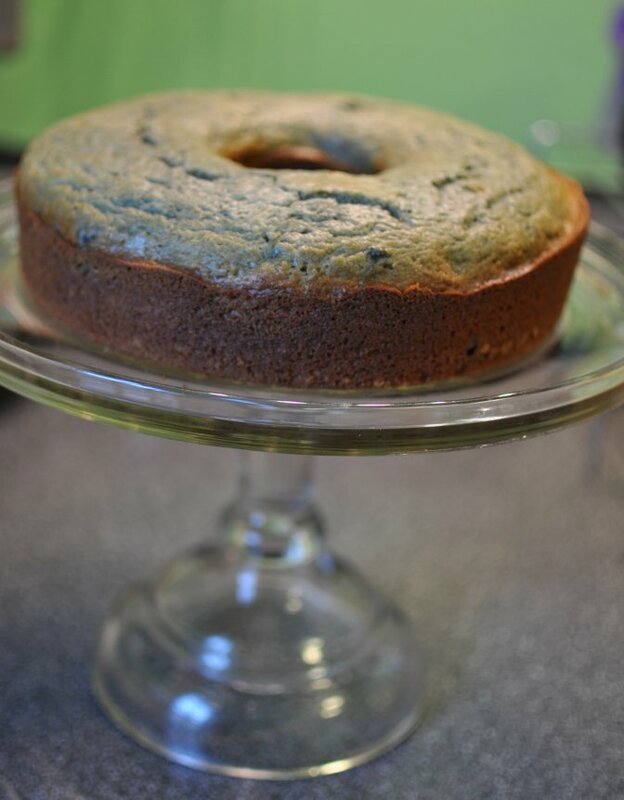 This cake turned a little greenish-blue due to the fresh figs. I think this would be a nice effect for a Halloween themed cake, don’t you? I frosted with vanilla store-bought frosting, on the top only. I figured that this cake would be sweet enough on its own. 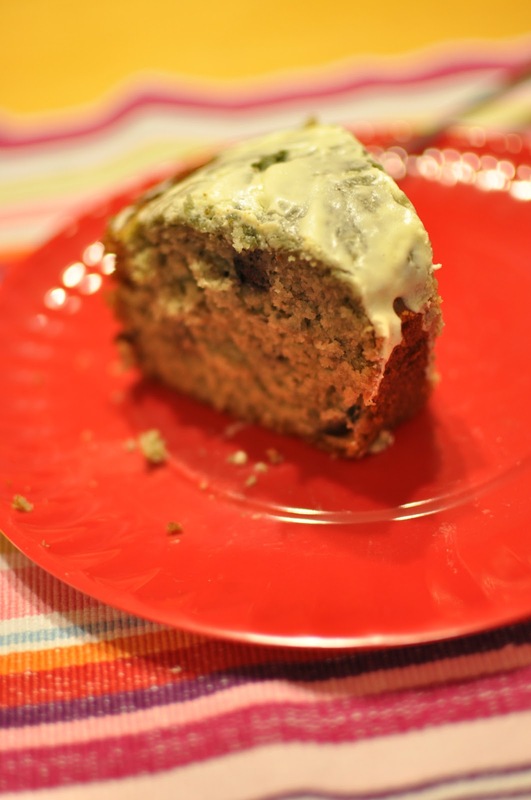 This cake is so moist and so delicious – I cannot do it any justice with photos. I will take more photos tomorrow with better daylight. Eric loved it so much he went back for seconds and even went so far as to say this was my best cake yet! Enjoy! In a saucepan, combine 1 cup of water, 2 tablespoons of brown sugar, and 8 oz of chopped fresh figs. Bring to a boil, stir well. Reduce to low heat and simmer for 20 minutes. 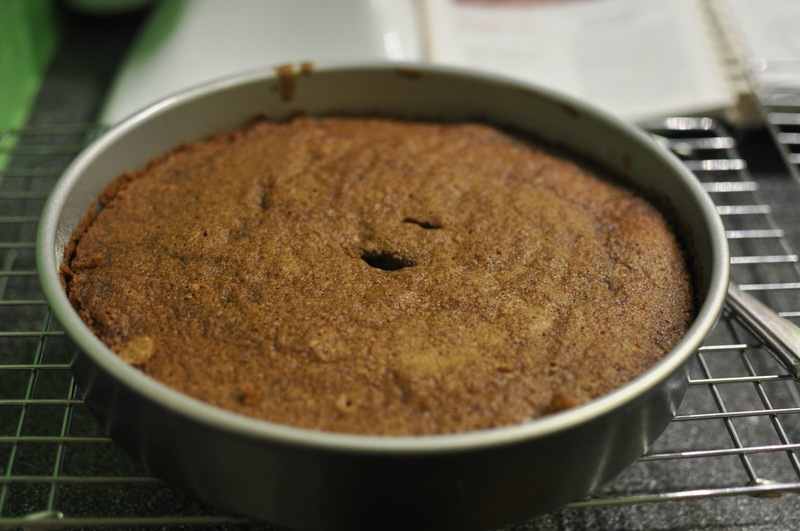 Allow to cool before adding to cake. 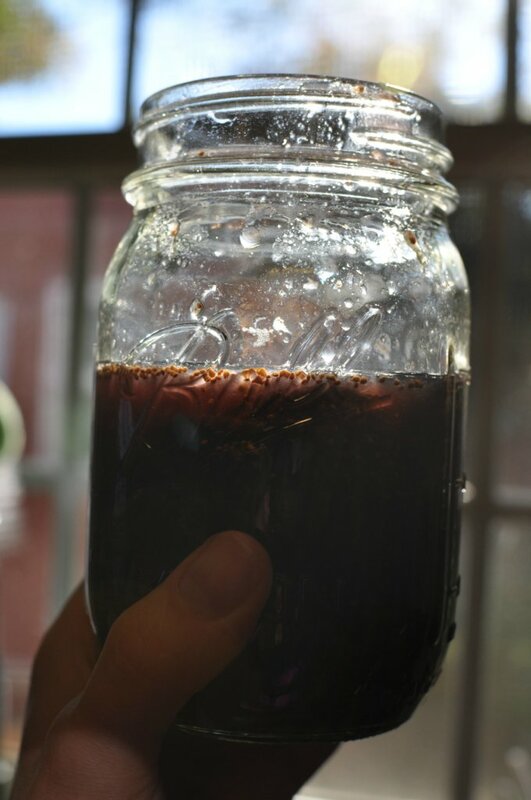 Makes about 1-1/2 cups of fig syrup. In a medium mixing bowl combine 2-1/3 cups all-purpose flour, 2 teaspoons baking powder, 1/2 teaspoon baking soda, and 1/2 teaspoon salt. Set aside. Add the 1-1/2 cup fig syrup and stir. 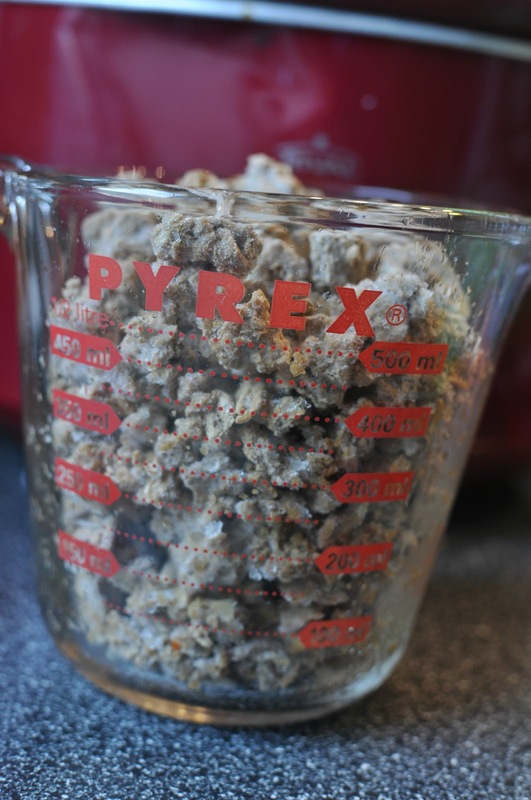 Add 1/2 cup milk and dry ingredients alternately to egg mixture, beating just til combined after each addition. 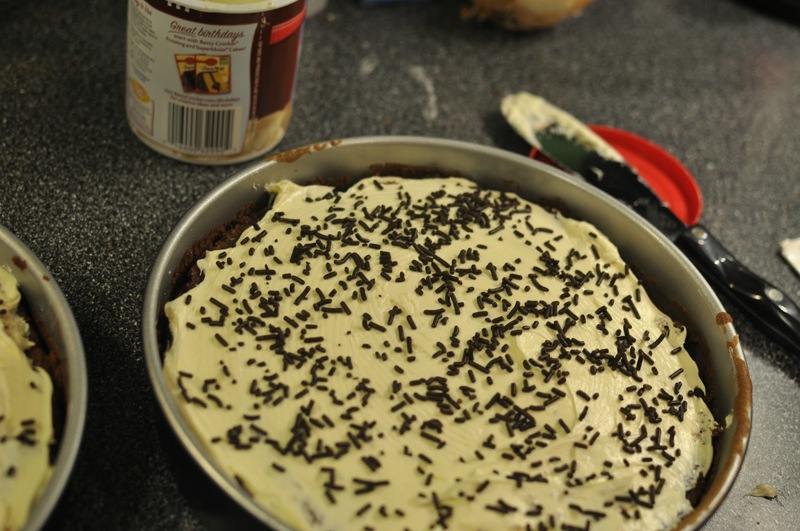 Pour batter into greased (I have learned to only use margarine) flute pan. Bake in a 350 degree oven for 40 to 45 minutes or til a toothpick comes out clean. Cool in pan about 10 minutes. 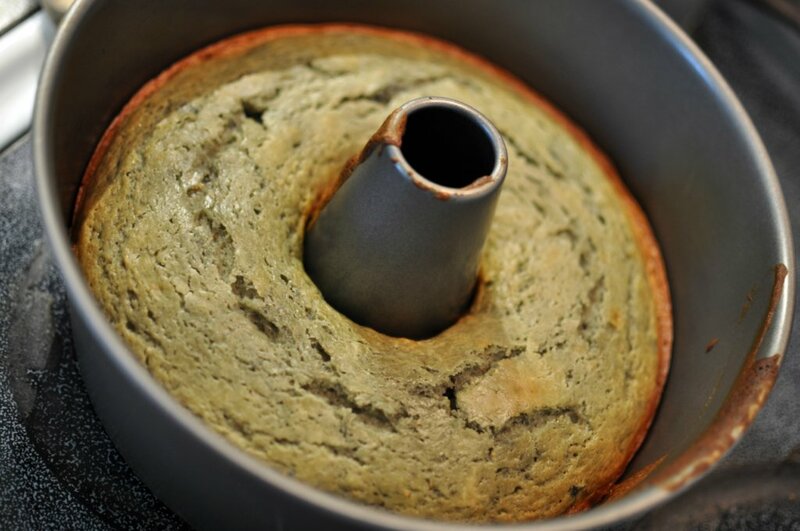 Remove cake from pan, allow to cool completely. Frost with vanilla frosting just on the top, however this cake stands alone very well, and does not need frosting. It’s Lindley Park Chili Cook-off Day! So, if you are in Greensboro area and would like to try some chili, stop by from 4 to 7 PM today. You can vote for my creation there, or you can try making it for yourself. 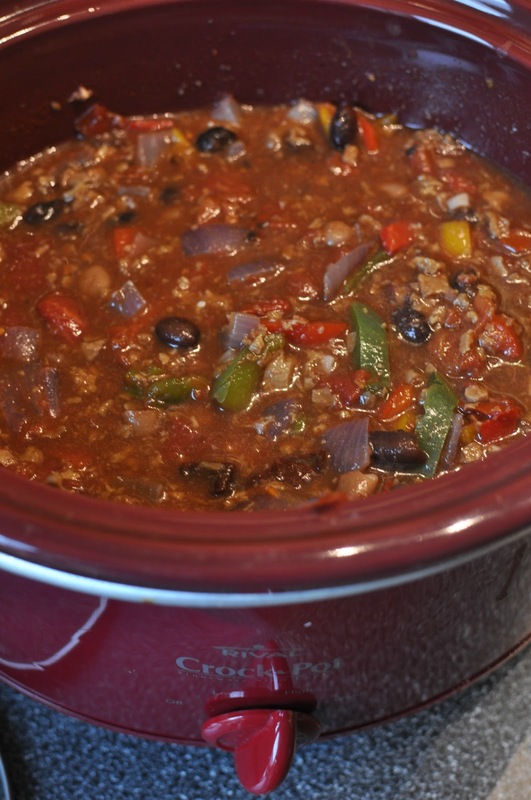 Mommy’s Medley Smoky Beer Chili. 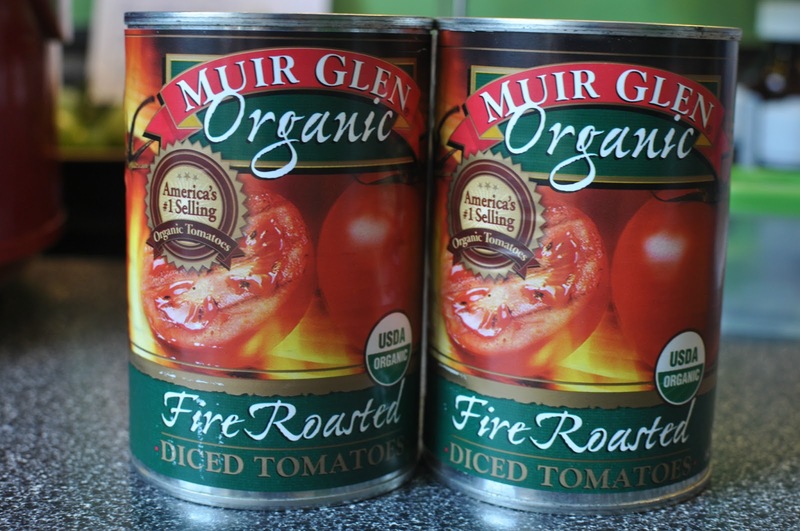 The fire roasted diced tomatoes are what make this chili so tasty. 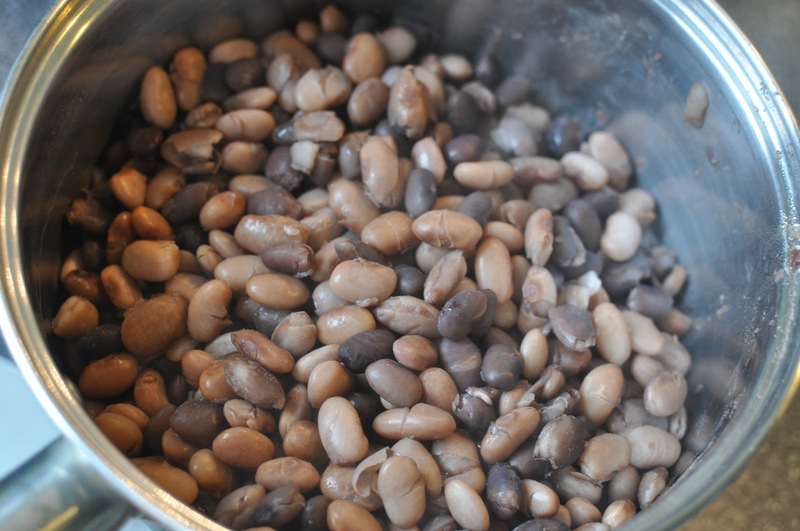 I like to use dried beans – if you are going this route, be sure to allow overnight soaking time. Otherwise canned beans work just fine. Heat 2 tablespoons oil in a large pot over medium heat. Saute 1/2 of a red onion and 3 cloves minced garlic until soft, about 4 minutes. Now you have two choices: slow cooker or stovetop. 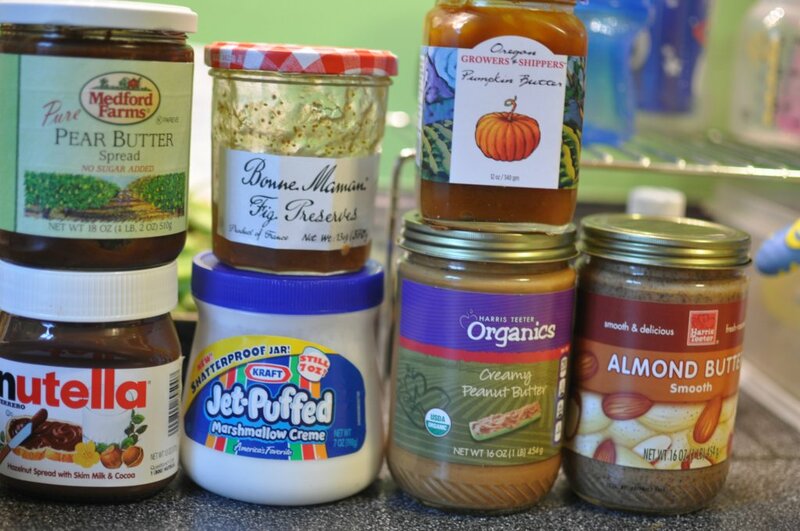 If you are going the slow cooker route, add the onions and all the following items together in a slow cooker. 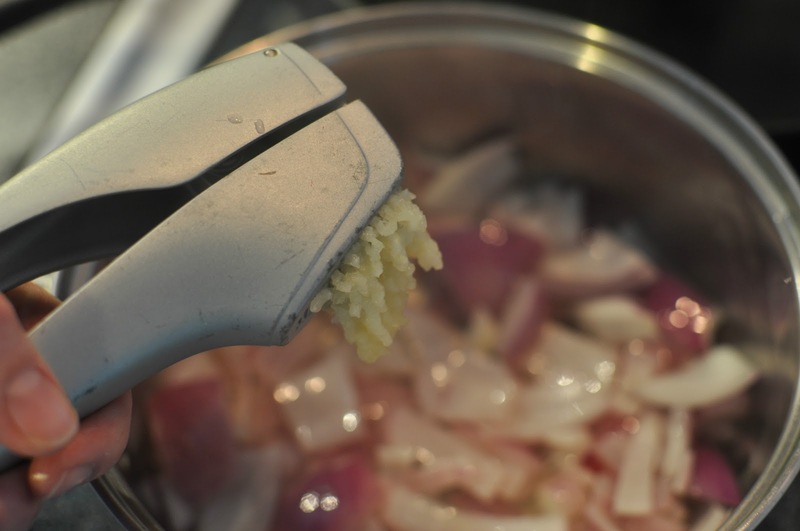 If you are going the stovetop route, add all the following items into the onion mixture. 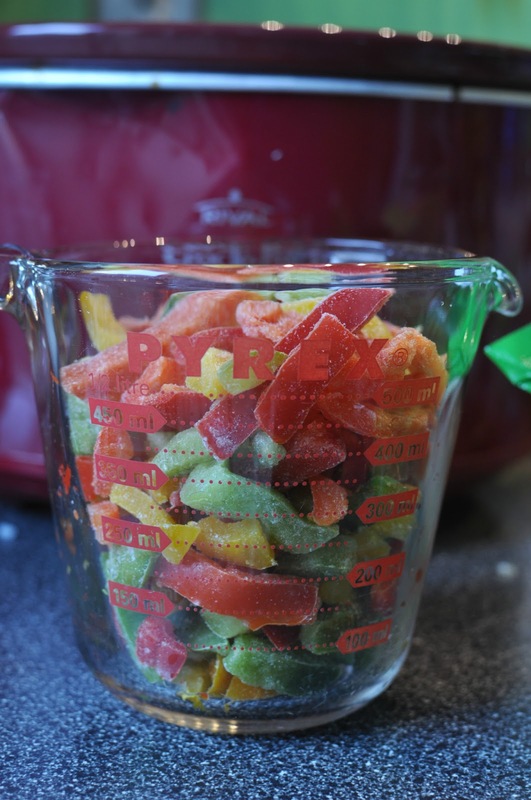 Add 28 oz (2- 14 oz cans) of fire roasted tomatoes, 10 oz of water, and just over 2 cups of frozen mixed peppers. Add 2 cups of soy crumbles. 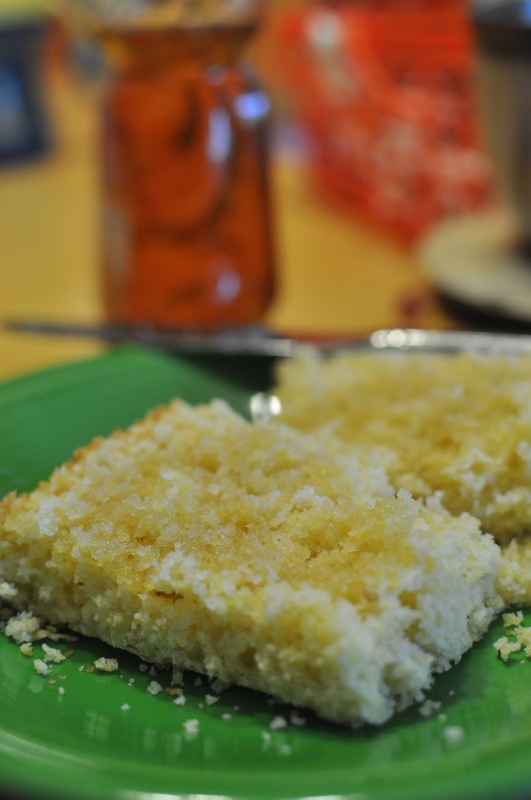 Note – I did omit the soy crumbles in today’s creation for the cook-off. I decided to keep it truly vegetarian and have no hint of meat texture. Dice 1 chipotle pepper, stir in well. 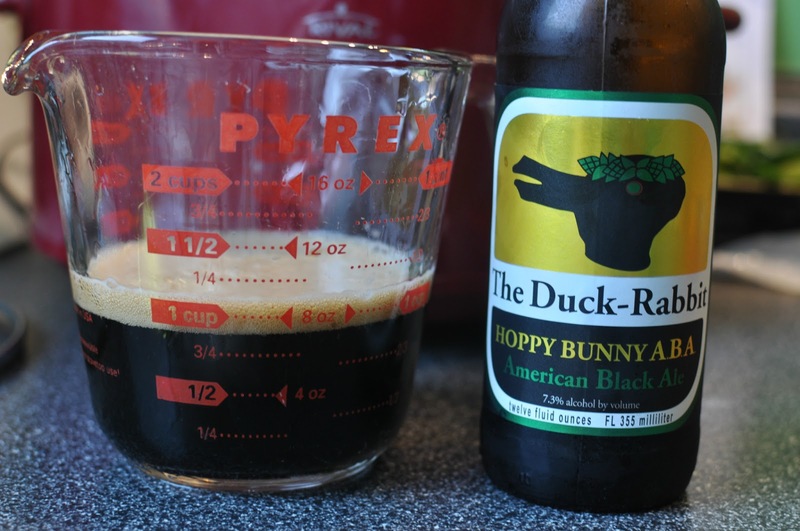 Add 1 cup of beer – dark beer adds more flavor! 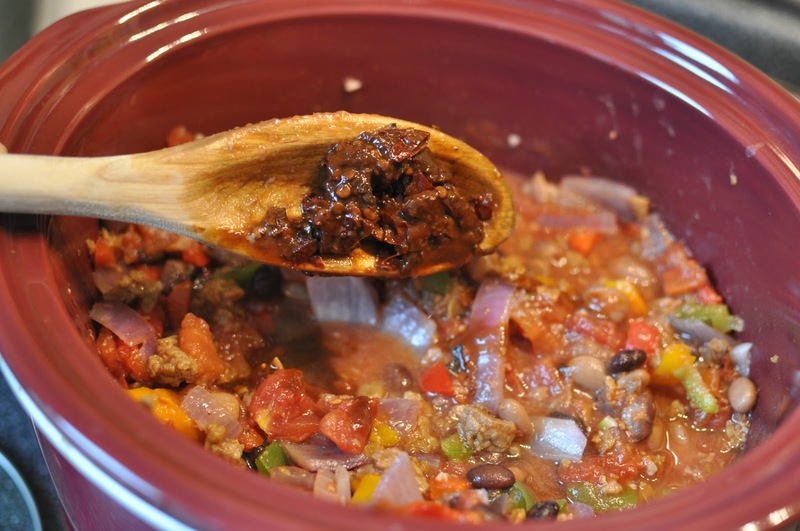 If using slow cooker, cook on low for 6 to 7 hours. 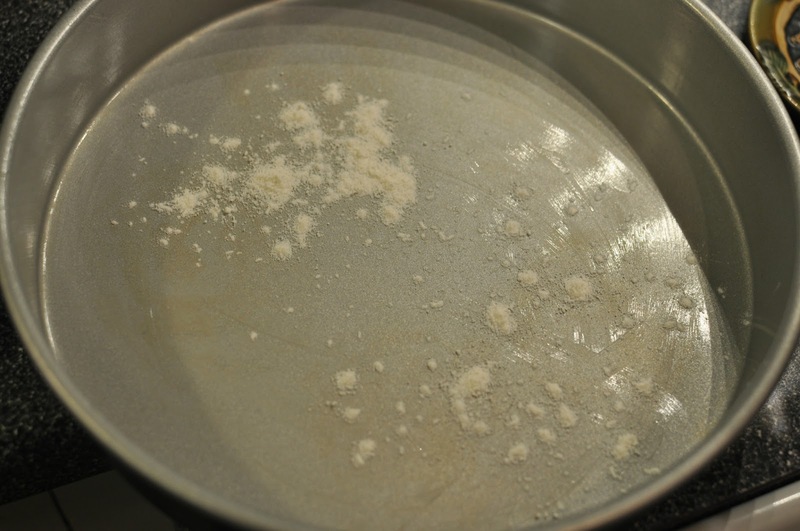 If using stovetop, bring all items to a boil, reduce to low and simmer with the lid off for 1 hour. Serve with cornbread and honey, of course. There are two cooking choices for this recipe: slow cooker or stovetop. If going the slow cooker route, add the onion mixture and all ingredients together in a slow cooker. 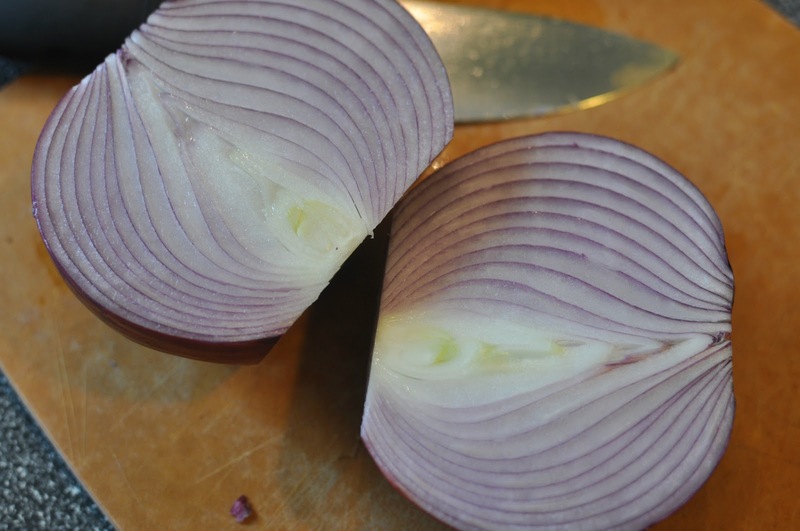 If going the stovetop route, add all ingredients into the onion mixture and be sure to use a large stockpot. 1. Heat 2 tablespoons oil in a large pot over medium heat. Saute 1/2 of a red onion and 3 cloves minced garlic until soft, about 4 minutes. 2. Add 28 oz (2- 14 oz cans) of fire roasted tomatoes, 10 oz of water, and just over 2 cups of frozen mixed peppers, 2 cups of soy crumbles, dice 1 chipotle pepper, 1 cup of beer and stir well. 3. If using slow cooker, cook on low for 6 to 7 hours. If using stovetop, bring all items to a boil, reduce to low and simmer with the lid off for 1 hour. 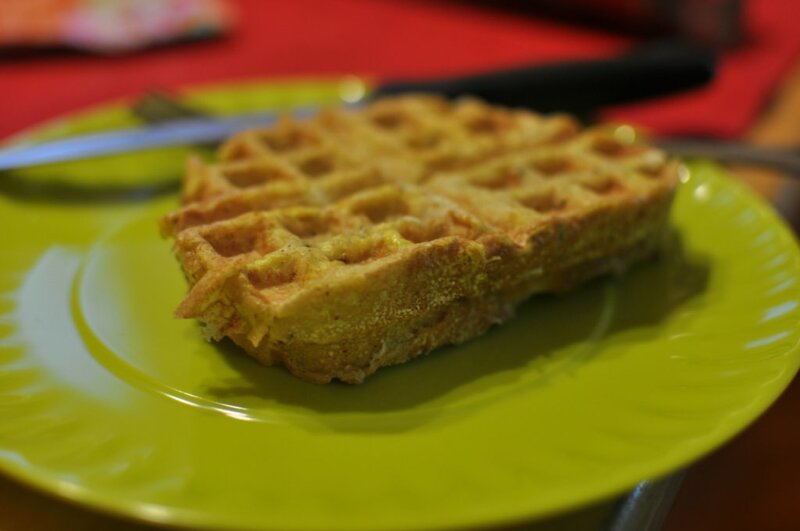 French Toast Waffle Sandwiches are this households’ favorite brinner food – they are easy, filling, and fun to make. The best part is that each person can tailor this meal to his or her flavors. First, start with dry bread. You can dry it in the oven for a few minutes, if need be. Next, choose your schmears. These were our options for this brinner. Greta got peanut butter and pear butter. 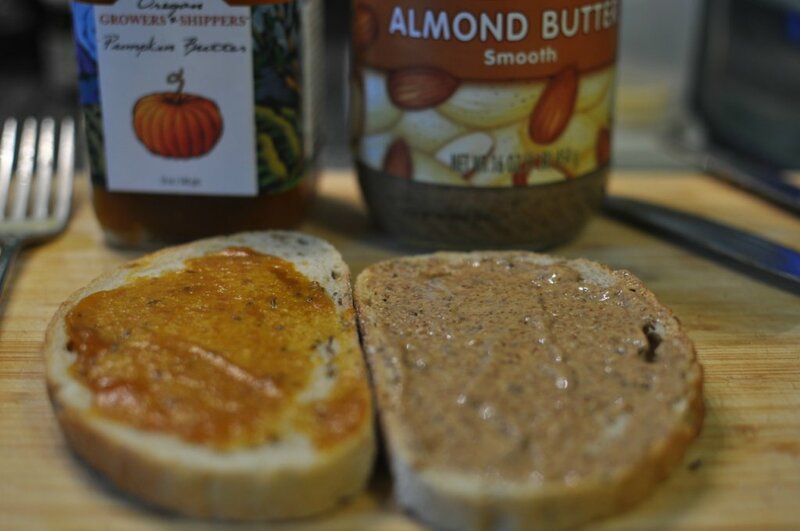 Eric and I both had almond butter and pumpkin butter. 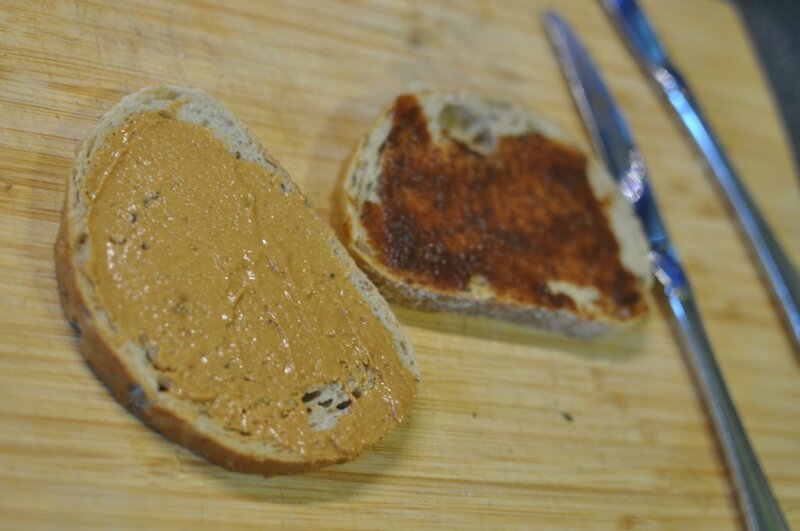 Spread your toppings on your bread, then put your sandwich together. 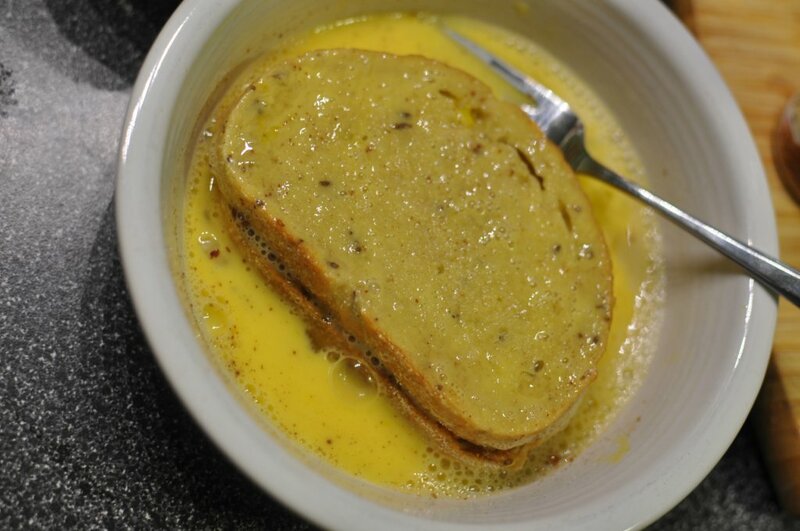 In a bowl, beat 1 egg plus a couple tablespoons of milk, a sprinkle of cinnamon, and a splash of vanilla, per sandwich. Soak the sandwich, flipping to allow both sides adequate egg mixture. 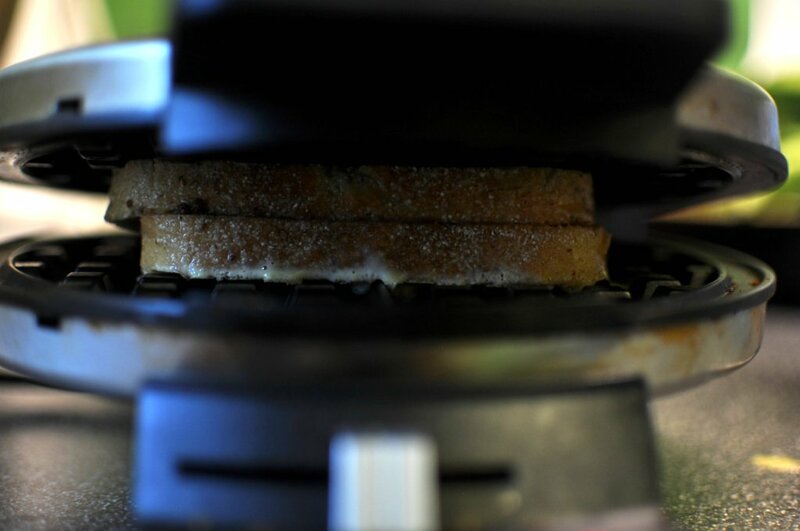 Place soaked sandwich on a preheated waffle iron. Close, press down once to smash sandwich a bit, and cook until done. 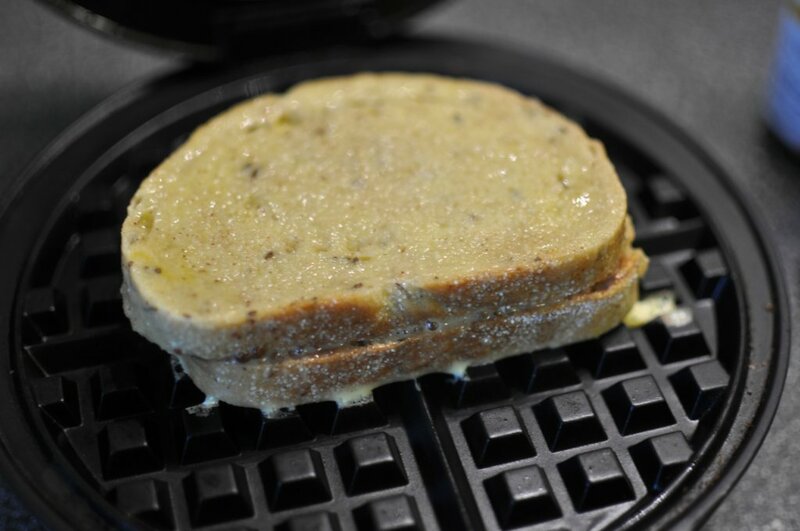 On my waffle iron there is a light that turns from red to green when the waffles are done. This is the perfect amount of time and even allows the edges of the bread to cook fully. 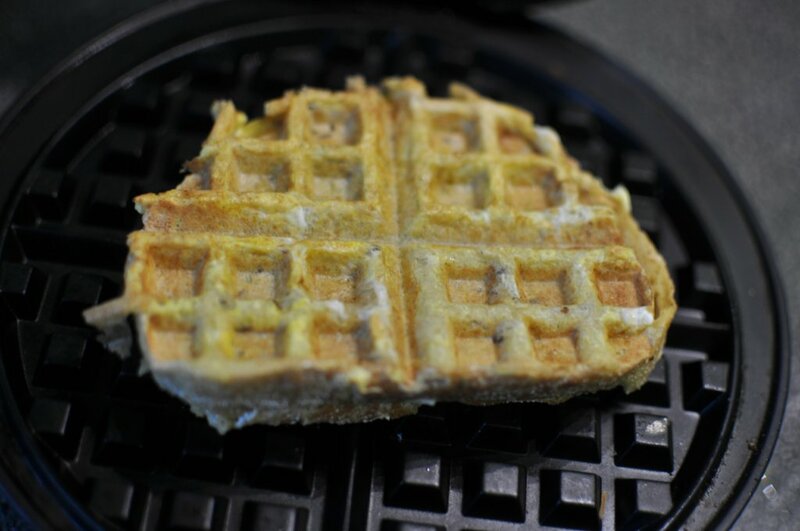 Your waffle sandwich should be golden. Serve as is or with toppings. 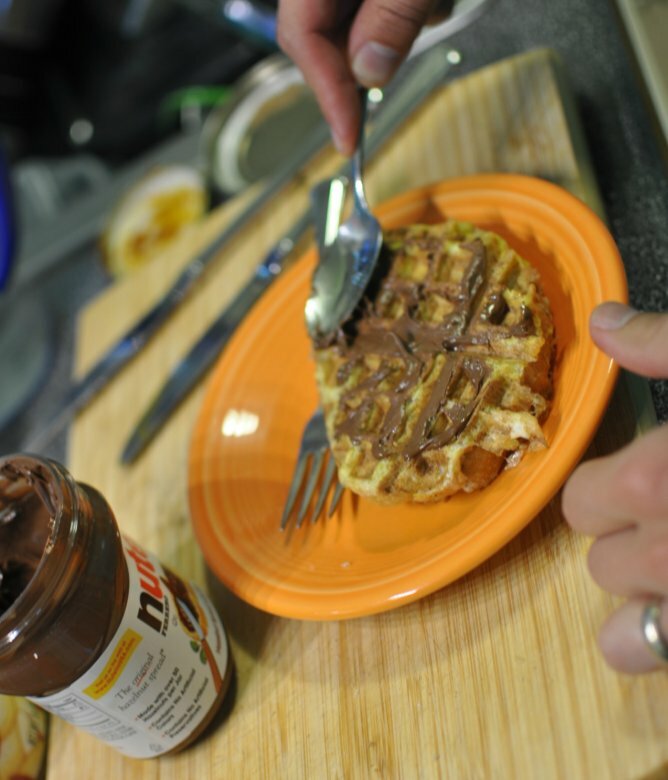 Eric opted for a Nutella spread on the top of his waffle sandwich. 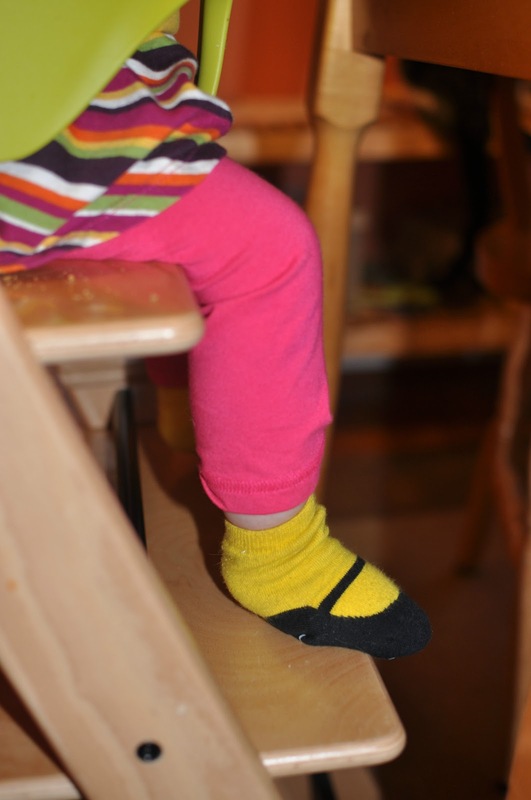 Greta’s happy little feet kicked all through dinner. 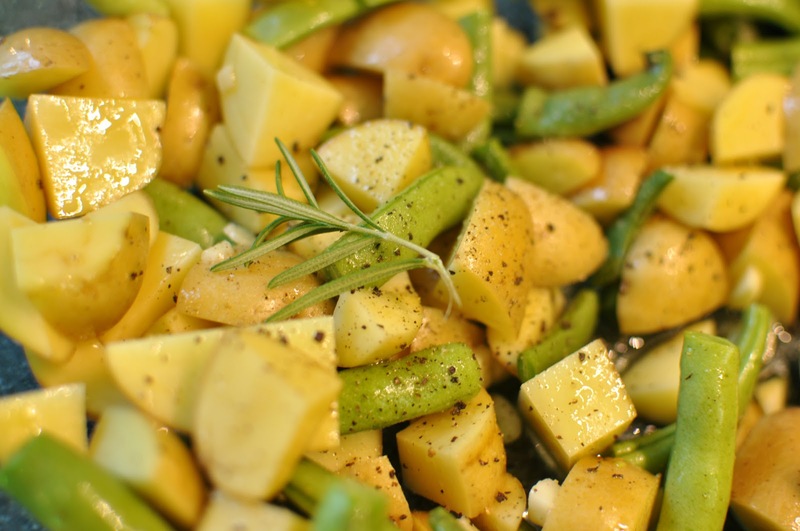 This is crowd pleasing meal and so easy to tailor to specific palates. Next time I am going to try a more savory combination of goat cheese and figs on the inside. This weekend we celebrated our 5th wedding anniversary, I did a practice run of chili for the Lindley Park Chili Cook-off on the 20th (more to come on this topic), we ate fair food, and we visited an art museum. 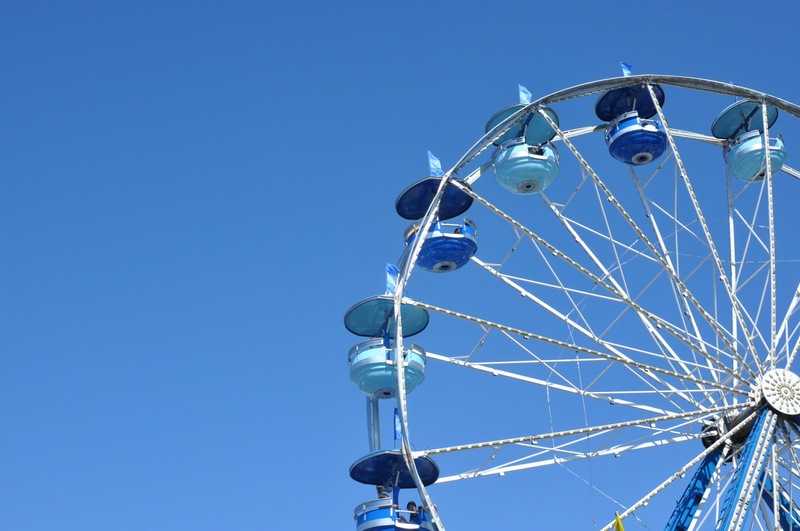 We headed off to the North Carolina State Fair in celebration this past weekend. 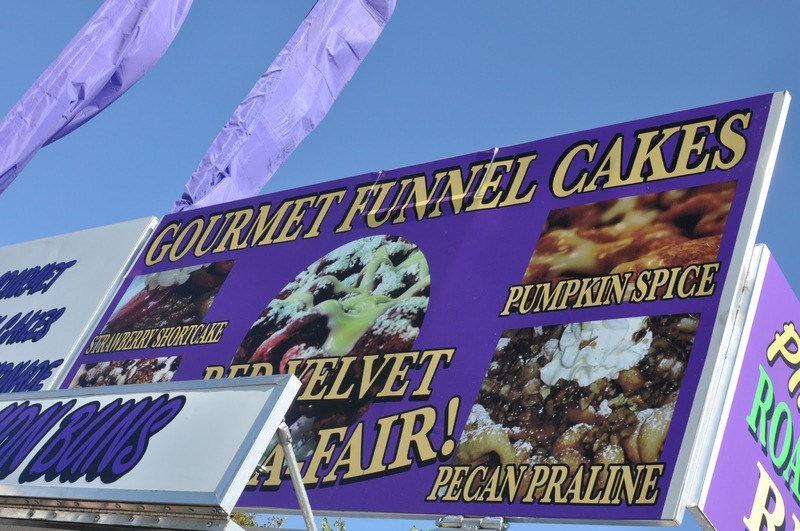 This was my first visit to the North Carolina State Fair, and I was not sure what to expect. I was afraid I would compare this to the Iowa State Fair, and of course I did. 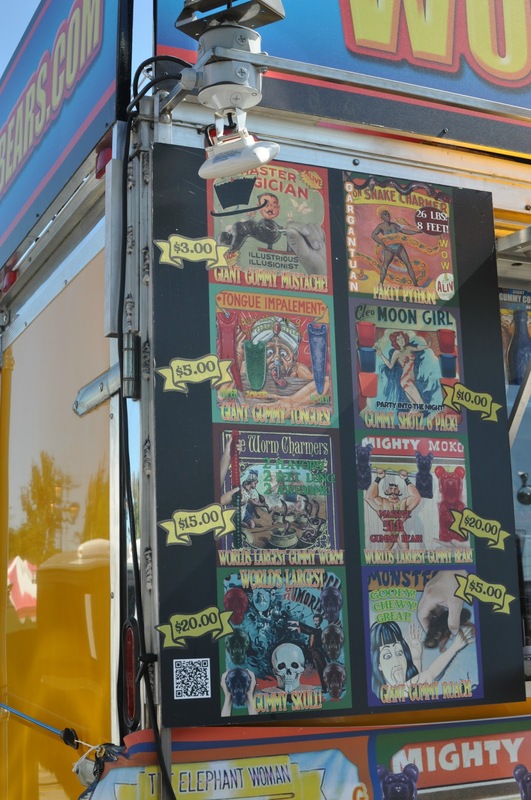 However, this is not a comparison post, so I will focus on the fun things we experienced at this fair. 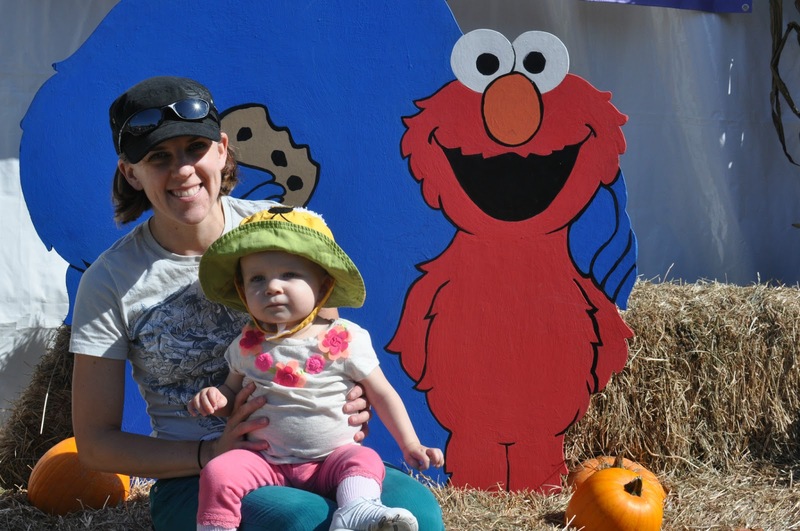 It was a beautiful sunny day with cool temperatures.This was the first time I can say I wore jeans and a sweatshirt to a state fair. 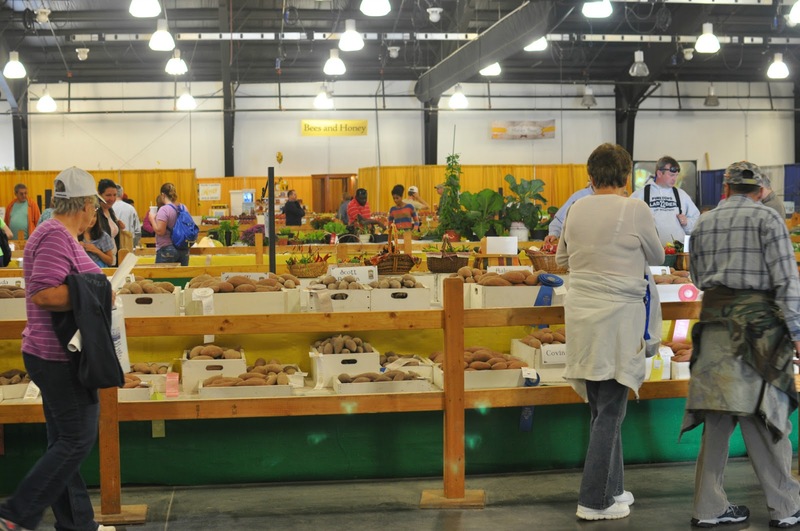 We checked out some sweet potatoes first. Then my sweet potato checked out the prize-winning steer. 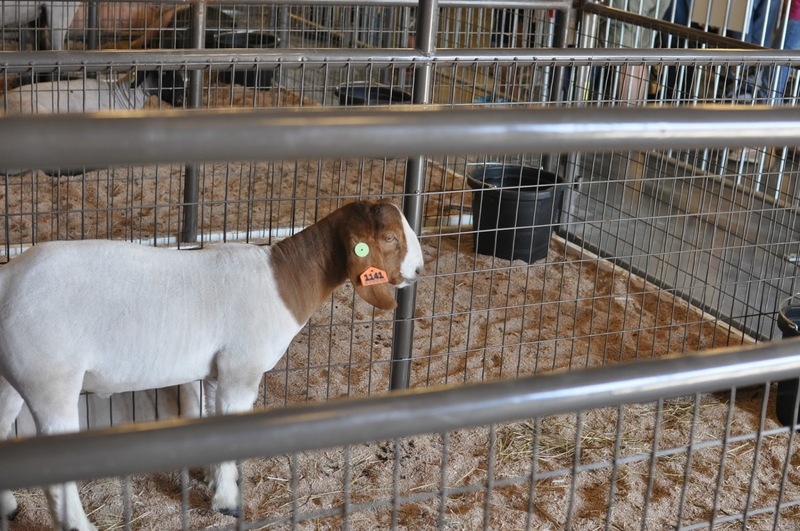 Meat goats were entertaining – this one kept trying to eat the banner hanging behind its pen. Greta really just wanted to see the goats. The UNC-TV tent was full of characters to pose with – we found Greta’s favorite! Eric was lured into the food area – which was extensive! 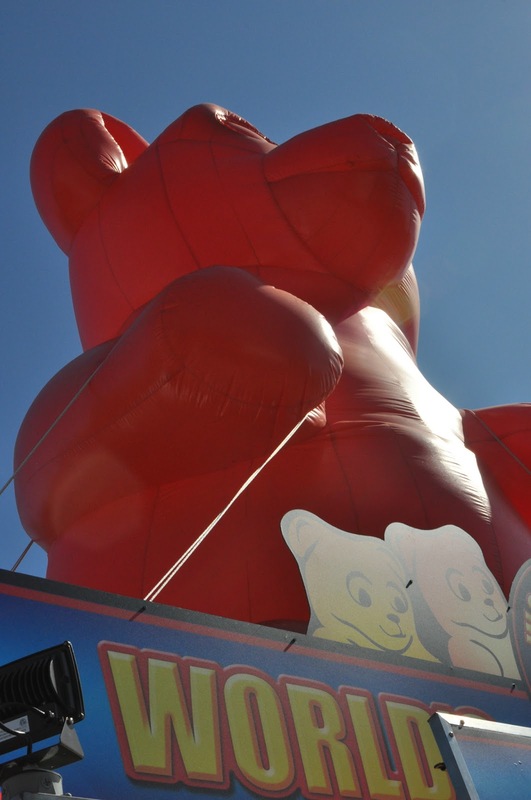 We found a huge gummy bear. 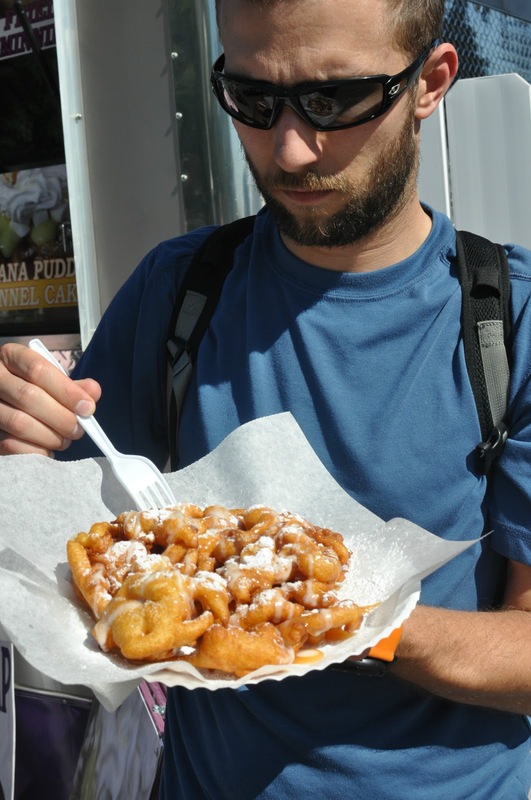 The gourmet funnel cakes had something for us both – funnel cake for him and pumpkin flavor for me. 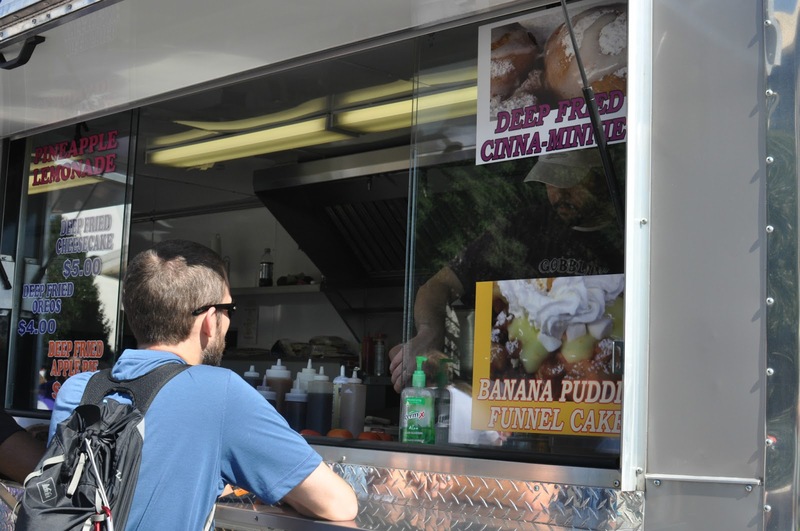 Banana puddin’ funnel cake was on the menu. 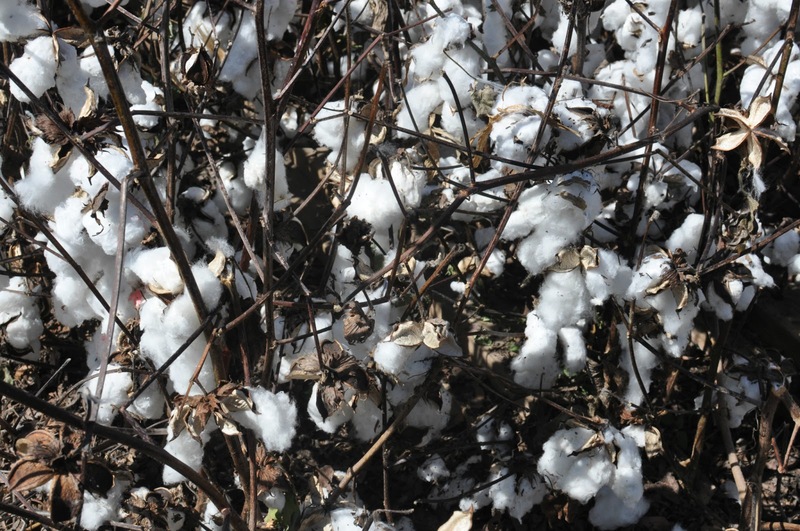 We stood next to a cotton patch as we ate up our funnel cake. 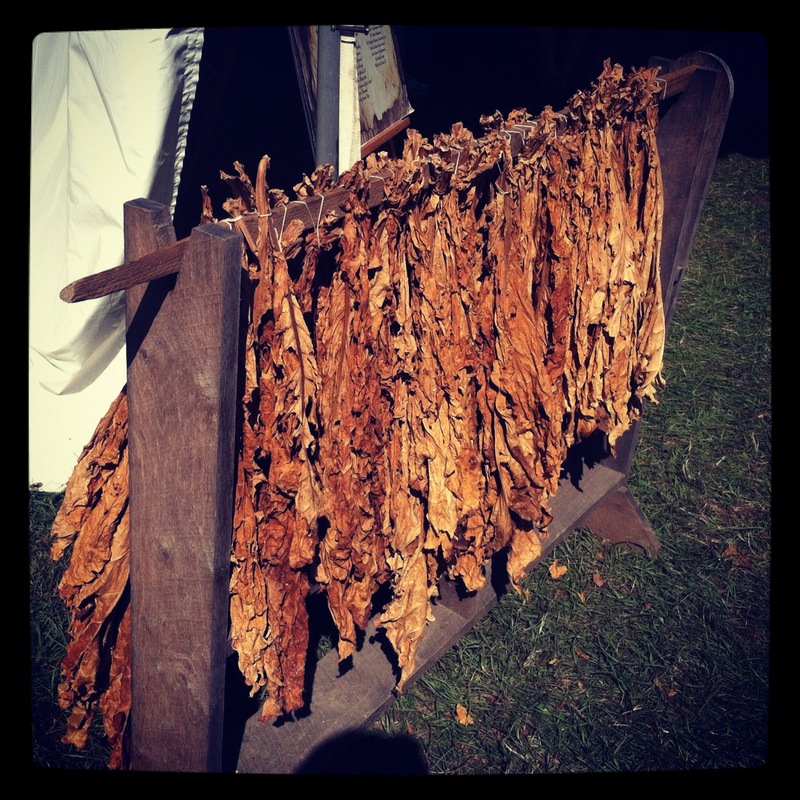 We saw loads of drying tobacco and listened to some bluegrass. We found a saw demonstration next. The entire contraption was powered by steam and leather belts, and when they blew the horn I thought Greta was going to scream. 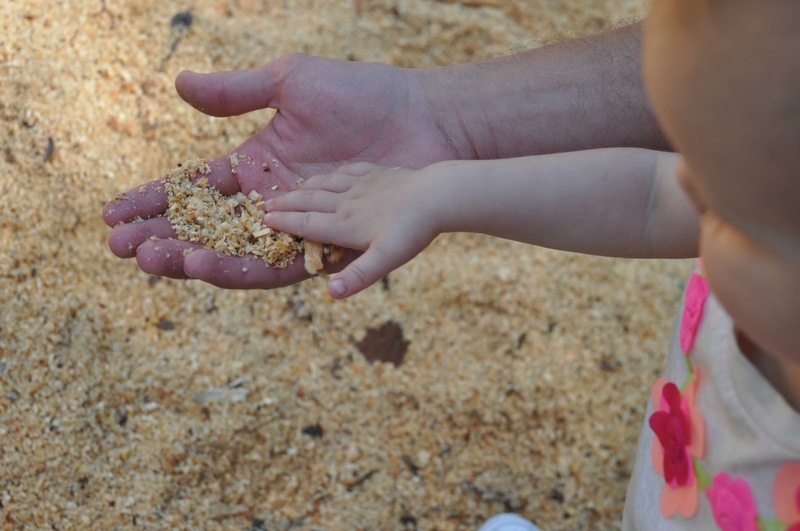 Eric and Greta were enthralled with the demo and the gigantic sawdust pile. 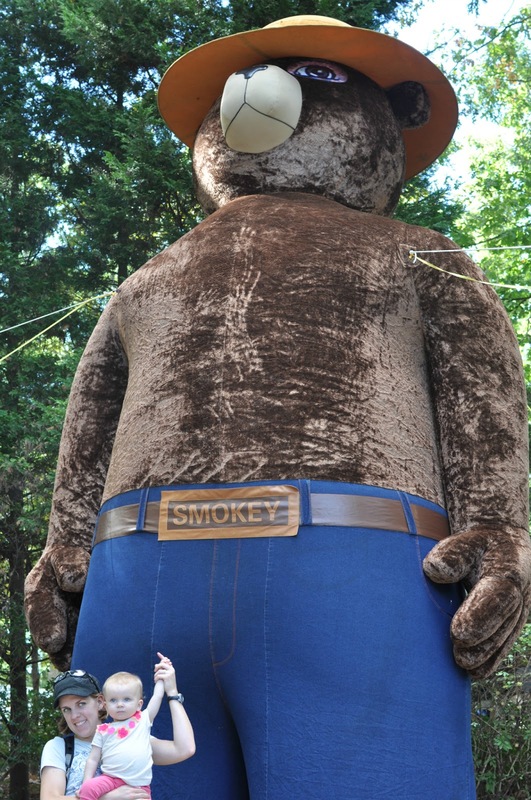 Smokey the Bear towered over us. Did you know North Carolina is the cradle of forestry? 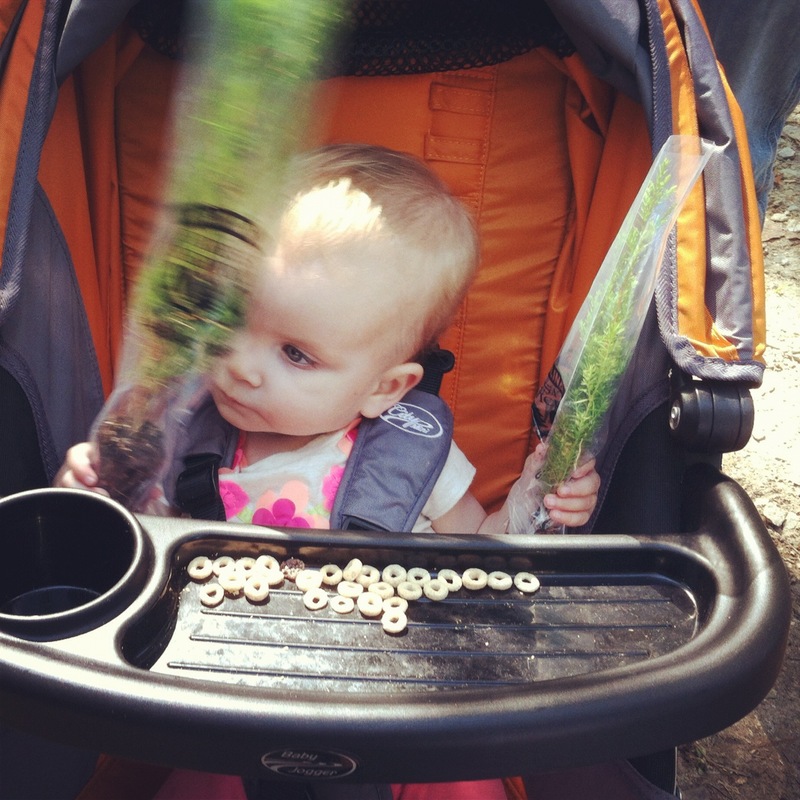 Greta got two free saplings – a juniper and a loblolly pine – the state tree. We planted them as soon as we got home. 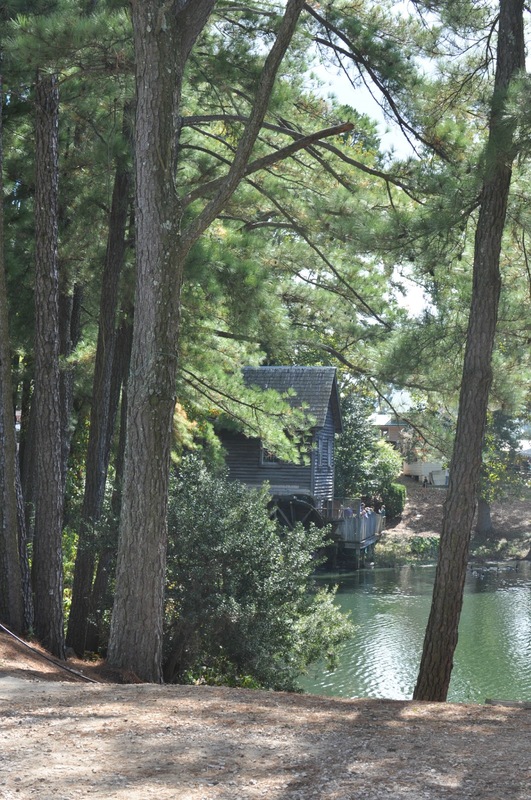 This beautiful lake, wooded area, and mill were at the entrance to the state fair. We crossed a couple bridges to actually get into the fair grounds. It was a nice quiet area of the fair. 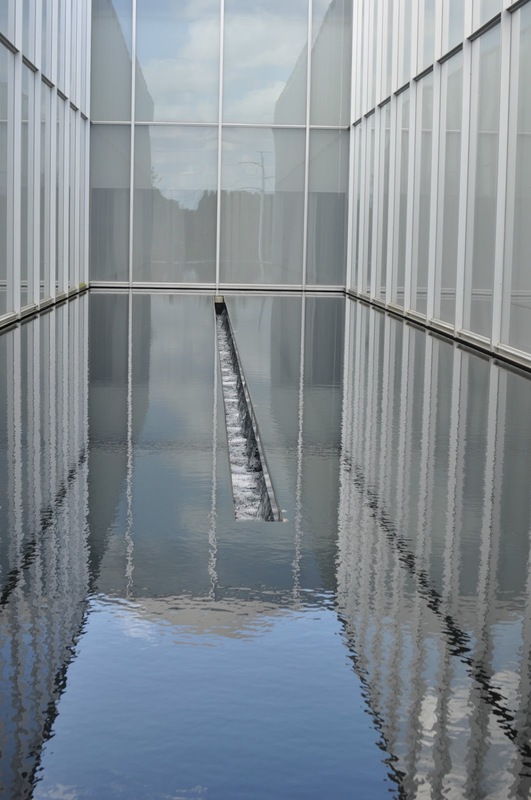 After we were exhausted of the crowds, we headed over to the serene North Carolina Museum of Art for a late lunch. 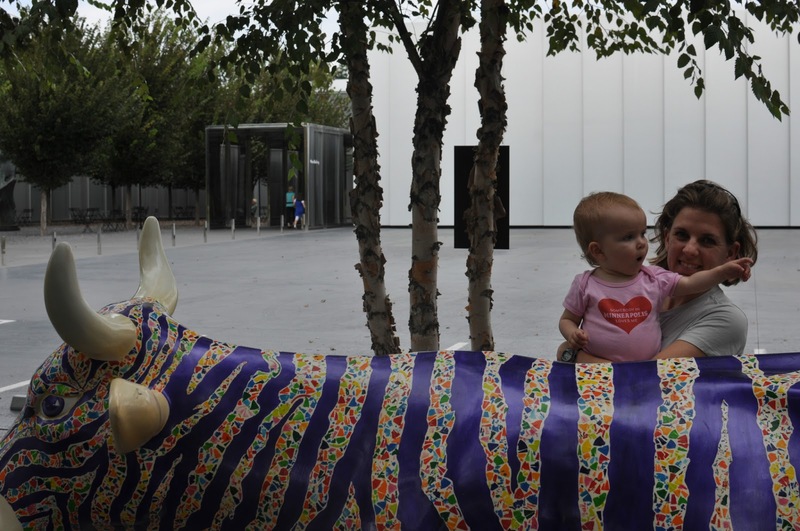 This confetti zebra cow was outside in the courtyard. 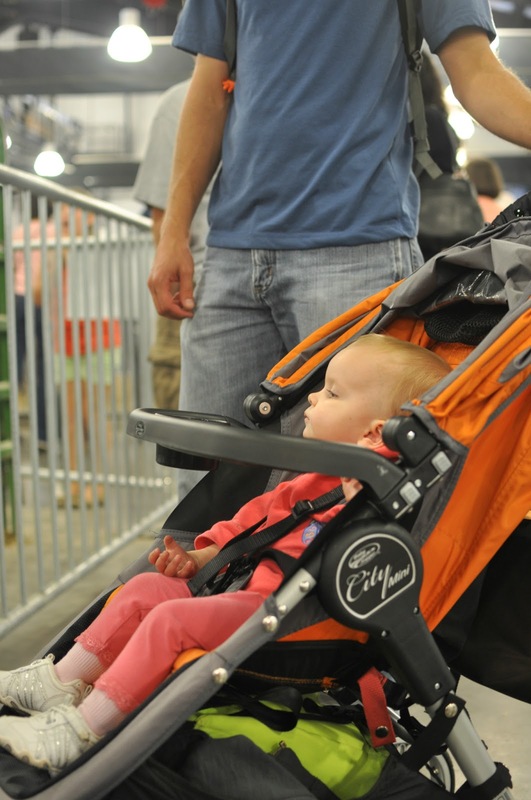 I was hoping to show Eric the trails around the museum, but Greta was too tired and ready to head home. 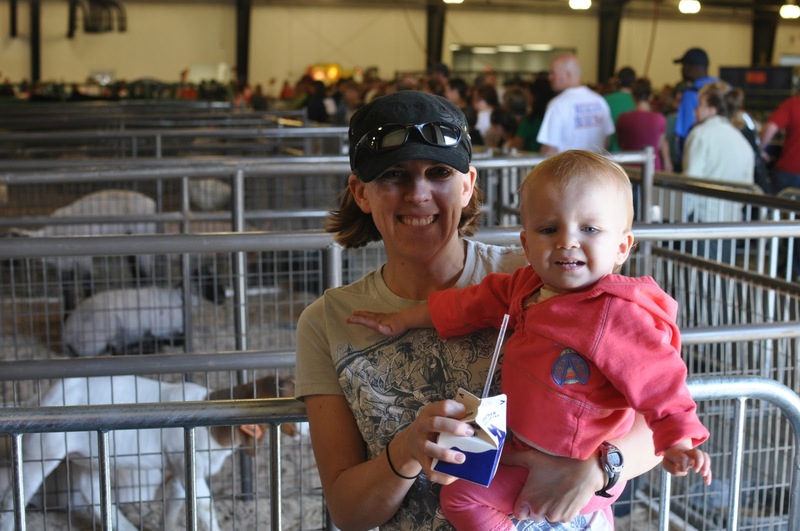 We had a great weekend – hope you can make it out the fair before the 21st of October. We recently celebrated a colleague’s birthday with cake during our lunch time planning and I volunteered to make the cake this time around. I figured it was only fair to use more of the leftover chocolate bars from the PE fundraiser to make a cake for my colleagues. Hence the dark chocolate almond cake. Stir together 2-1/4 cups flour, 1 teaspoon baking powder, 3/4 teaspoon baking soda, and 1/4 teaspoon salt in a mixing bowl; set aside. 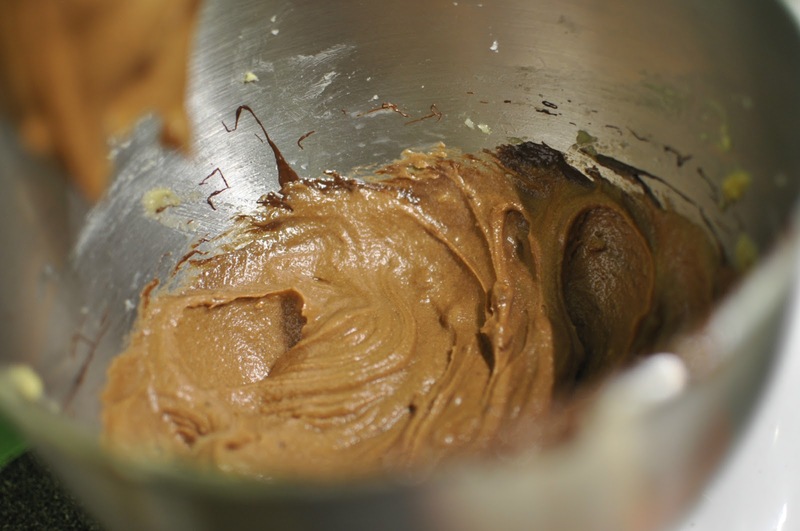 In a large mixing bowl or using a mixing stand, beat 2/3 cup butter on medium speed for about 30 seconds. Add 1-3/4 cup sugar; beat until well combined. Add 2 eggs, 1 at a time, beating well after each addition. Time to bring out the chocolate bars! Melt and cool 3 ounces of dark chocolate almond candy bars. Beat in chocolate and 1 teaspoon vanilla to batter. 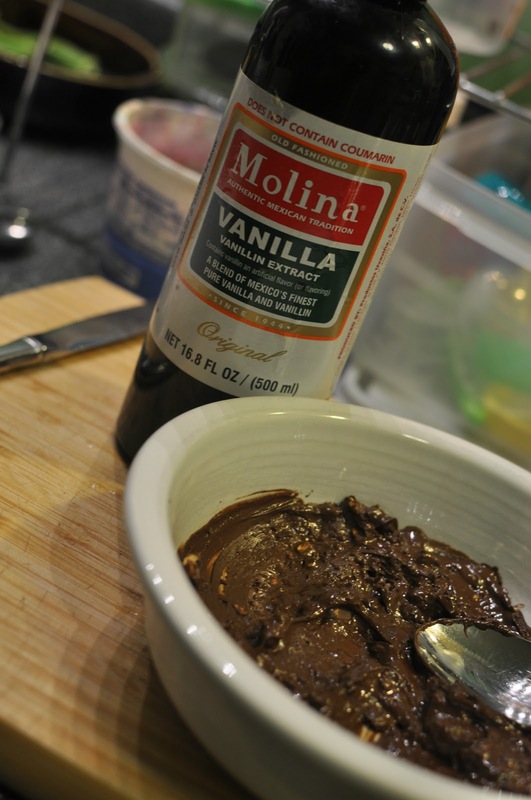 My vanilla from Mexico is my favorite – my mother-in-law gave this bottle to me. 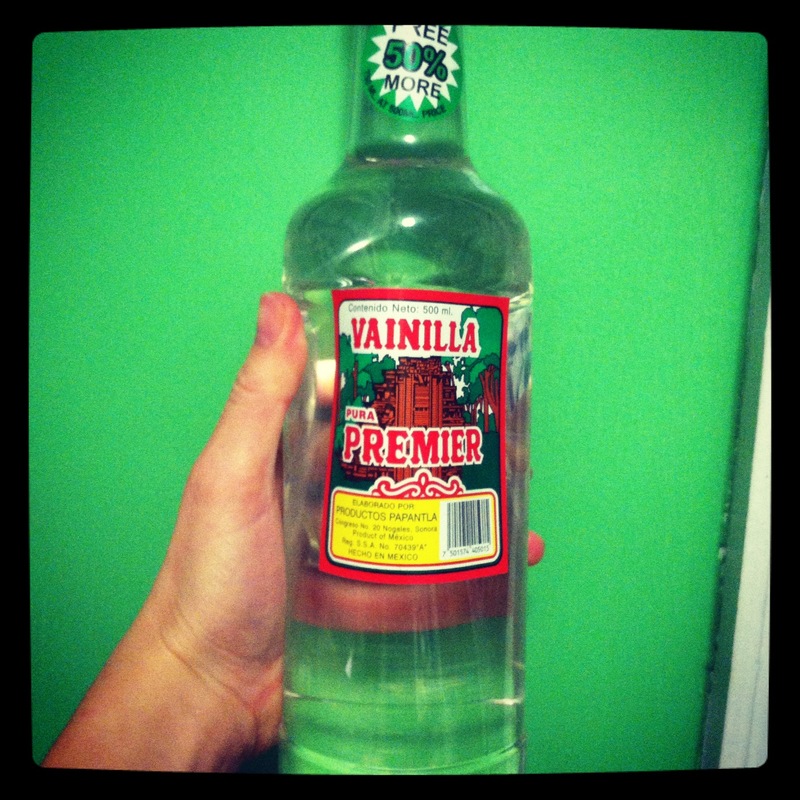 I will have to start looking for a source for good vanilla since my bottle is almost dry! Add 1-1/4 cup water and flour mixture alternately to egg mixture. Beat on low speed after each addition just until combined. Grease (with margarine) and lightly flour two 8-inch pans. 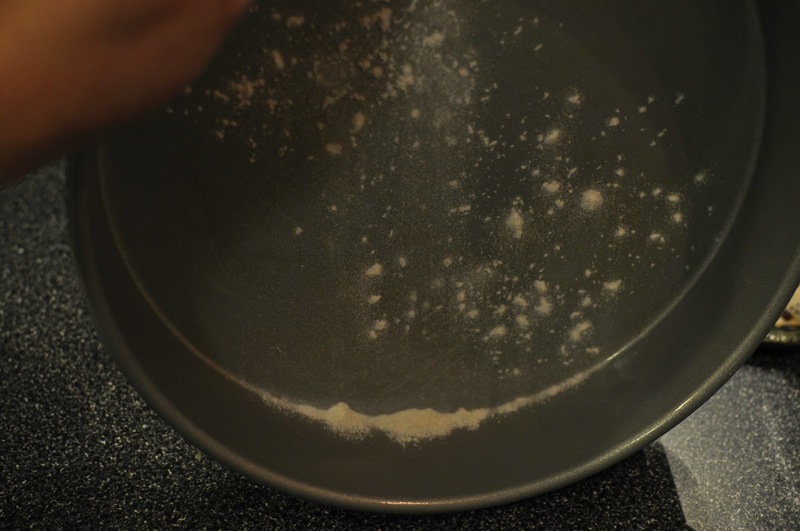 Sprinkle the flour and then use your hands – opposite one another like on a steering wheel – to turn the pan while lightly tapping on the opposite side. This should help to more evenly distribute the flour. 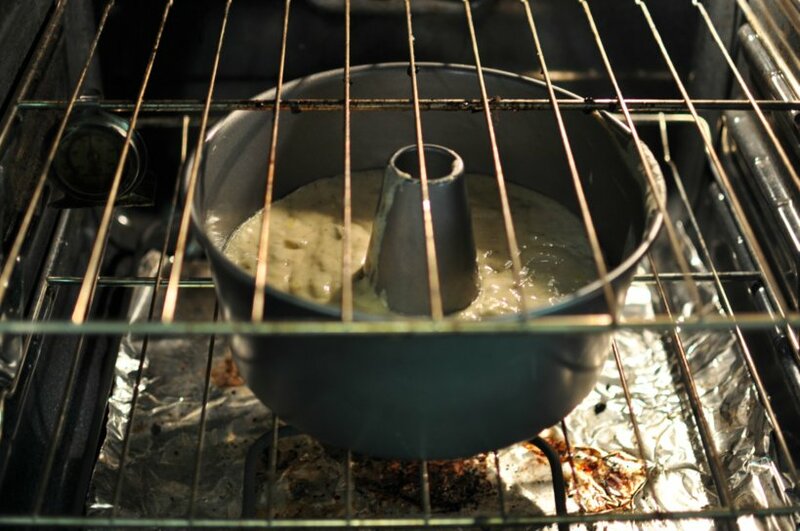 Bake in a 350 degree oven for 22 minutes or until a knife or toothpick inserted in the center comes out clean. Cool pans on wire racks for 10 minute. Remove from pans and allow to cool completely. 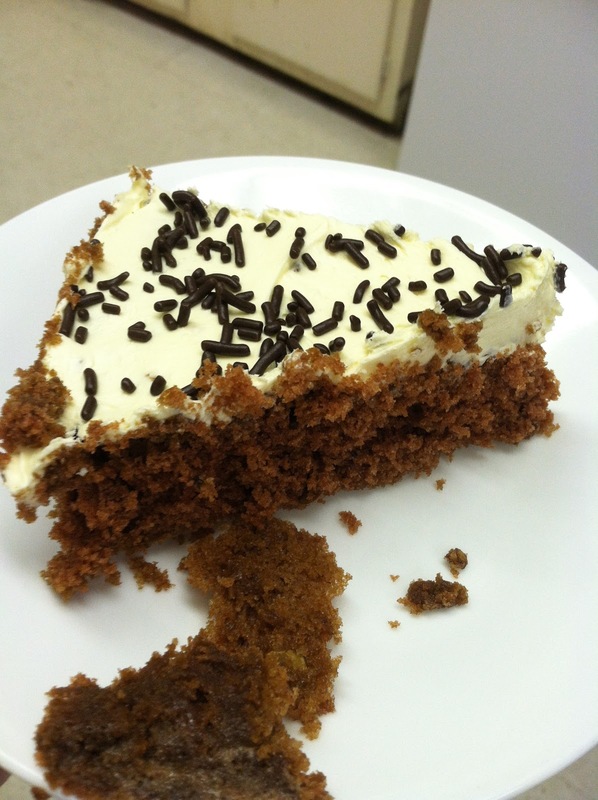 Frost with desired frosting – I used whipped vanilla and it was heavenly. 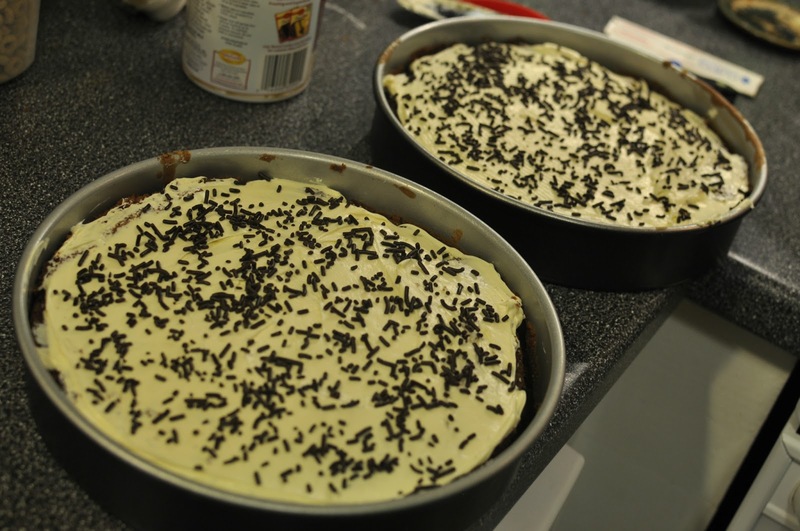 For time sake and a sticky situation, I chose to leave my cakes in the pans. This actually worked out rather well for ease of transport and slicing. Everyone always seems to ask for a small slice, which I find easier to create on a single layer cake. 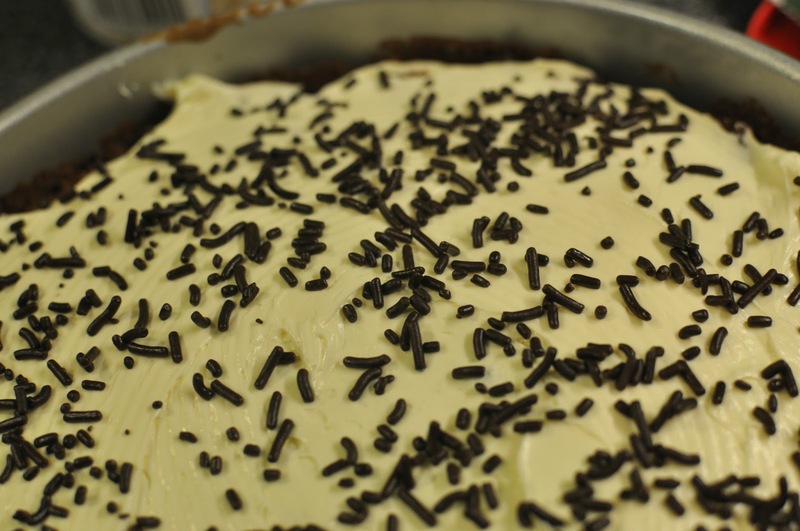 For good measure, I added chocolate sprinkles. Who doesn’t smile at sprinkles? 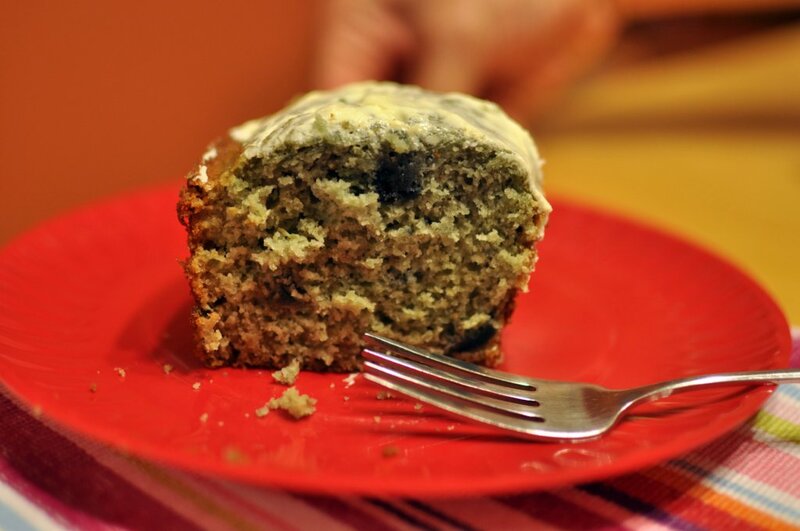 So moist and dense – exactly how a cake should be and those pesky box mixes never quite seem to measure up to my standards. 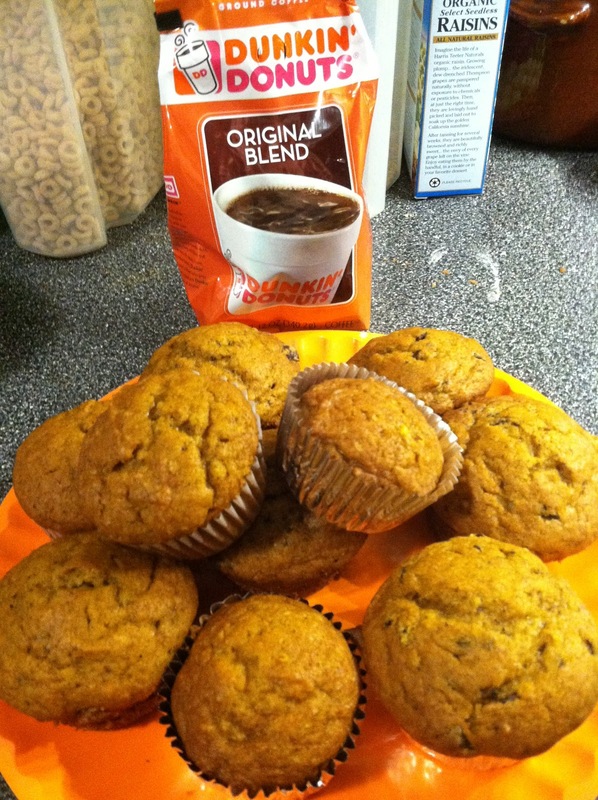 Then, because I am crazy, I made my pumpkin muffins with the addition of the dark chocolate almond bars. They were the perfect start to my morning of reffing soccer games for alley soccer intramurals. 1. 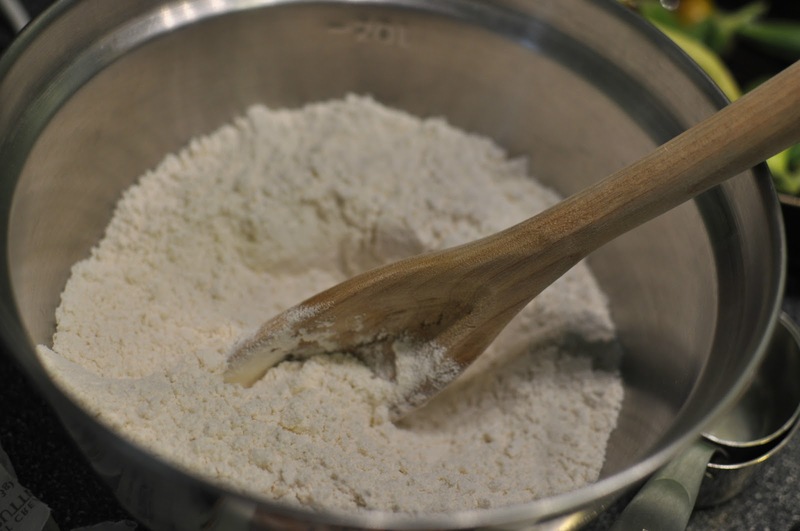 Stir together 2-1/4 cups flour, 1 teaspoon baking powder, 3/4 teaspoon baking soda, and 1/4 teaspoon salt in a mixing bowl; set aside. 2. 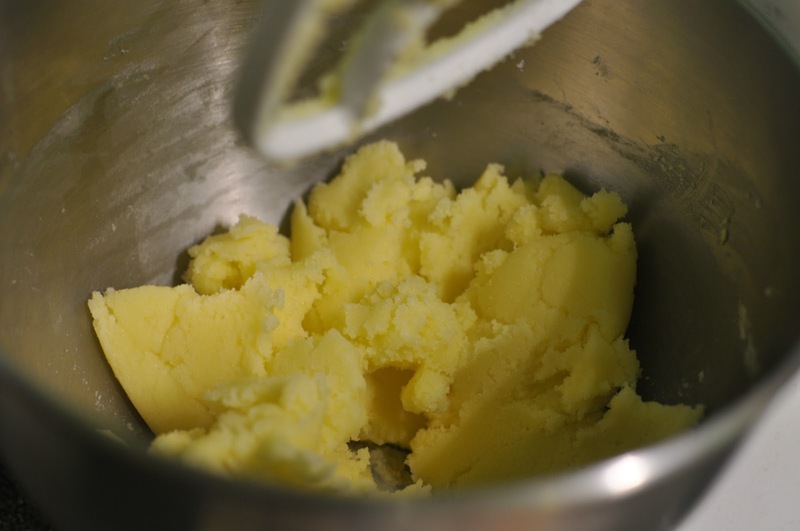 In a large mixing bowl or using a mixing stand, beat 2/3 cup butter on medium speed for about 30 seconds. Add 1-3/4 cup sugar; beat until well combined. Add 2 eggs, 1 at a time, beating well after each addition. 3. 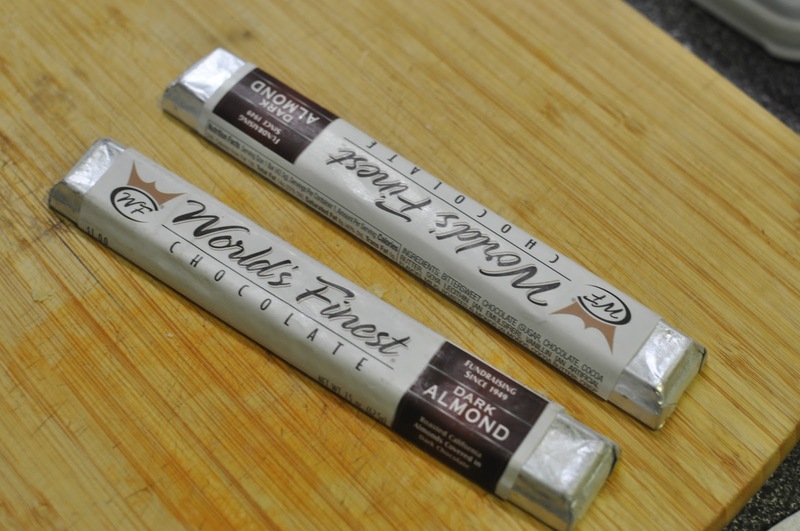 Melt and cool 3 ounces of dark chocolate almond candy bars. Beat in chocolate and 1 teaspoon vanilla to batter. Add 1-1/4 cup water and flour mixture alternately to egg mixture. Beat on low speed after each addition just until combined. 4. Grease (with margarine) and lightly flour two 8-inch pans. 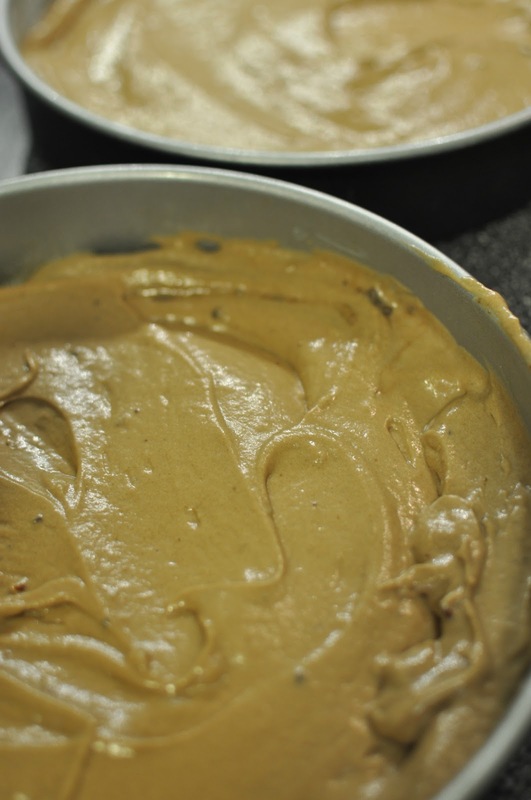 Pour the batter into the prepared pans. 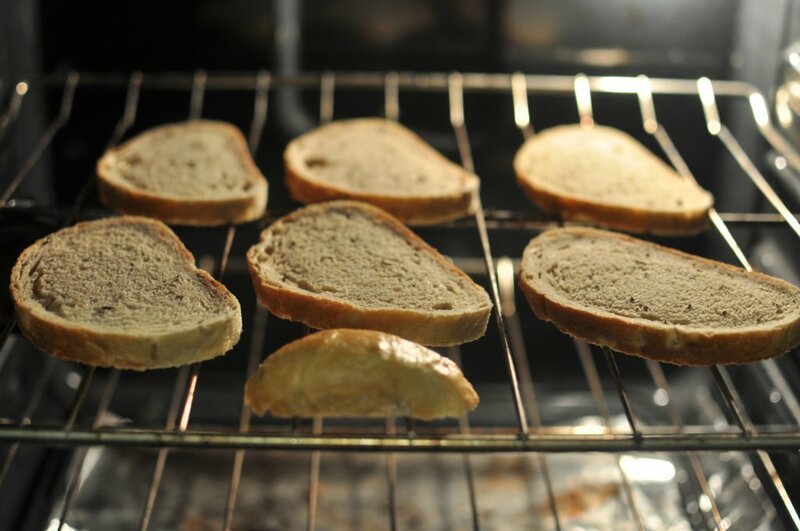 Bake in a 350 degree oven for 22 minutes or until a knife or toothpick inserted in the center comes out clean. Cool pans on wire racks for 10 minute. Remove from pans and allow to cool completely. Frost with desired frosting.